As many of you have probably noticed, I tend to have a strangely obsessive reaction to My Twinn dolls. Every time these girls grab my attention, they seem to keep it for days or even weeks at a time--at a feverish level of intensity. My first blogging visit to the My Twinn website ended with me compulsively scouring lists of discounted 23" Adopt-A-Friend dolls (and then bringing two of them home). 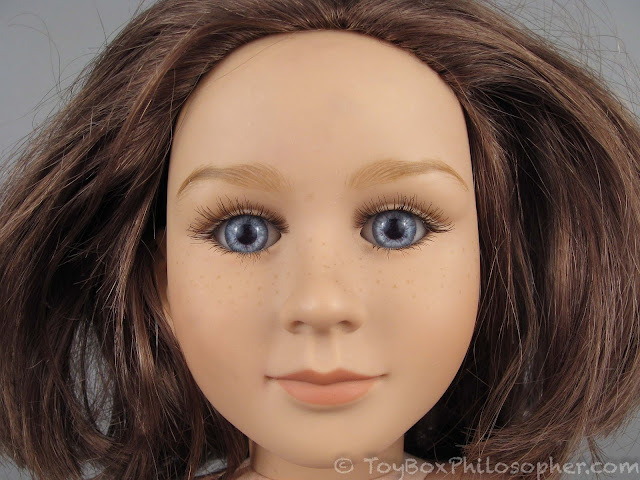 Next, I became enamored with the idea of ordering a custom doll (the result of which was my beloved 18" Annie), and most recently I took it upon myself to try and identify all of the 18" versions of the face molds...a fun challenge that consumed several entire days out of my life. 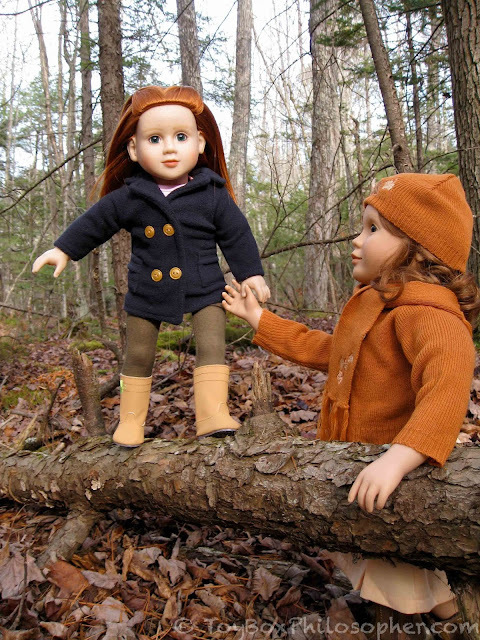 18" My Twinn Annie with my 23" Adopt-a-Friend, Hazel. 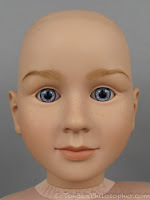 Oh--speaking of face molds, now there's a comprehensive (and correct) 18" face mold list over at Logan's Ladies that has the names of the dolls included. The Logan's Ladies site is my go-to resource for everything related to My Twinn. I could not have done this project without the help of that website. 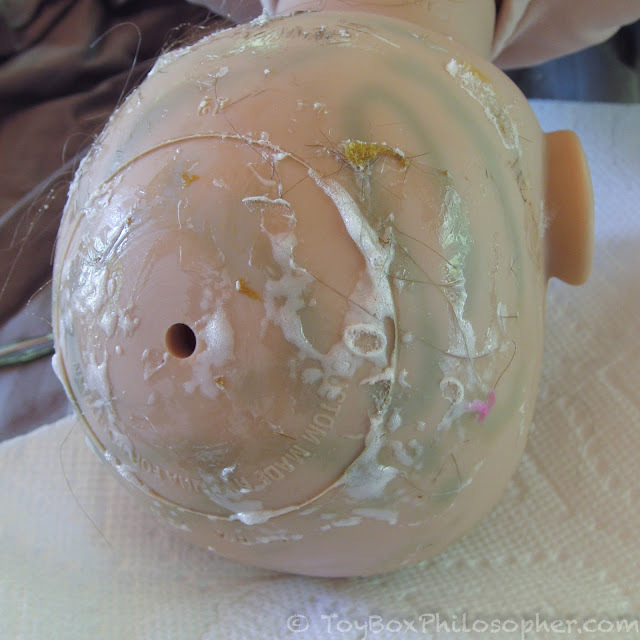 In particular, the doll care tutorials and 23" face mold reference have proved completely invaluable to me. 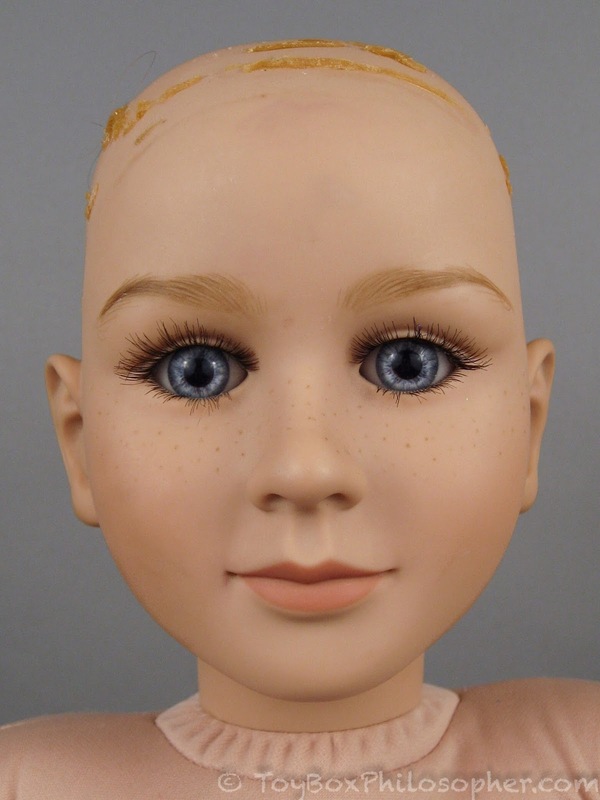 So, my mission here was to purchase a Denver era My Twinn doll from eBay--with no concern about the condition of the doll. 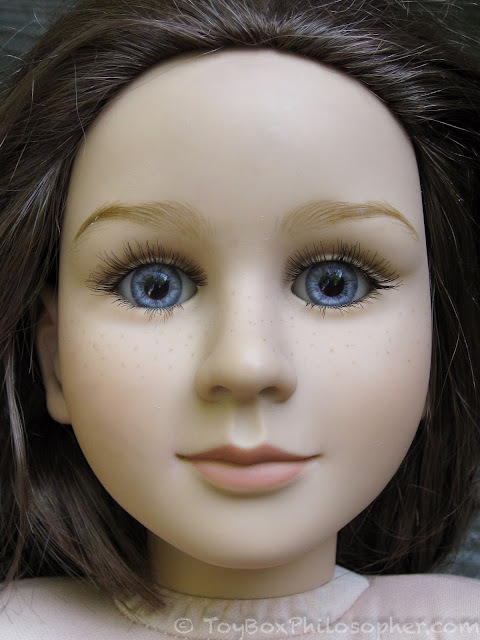 Denver dolls in excellent condition can cost $100 or more, but the dolls that need work often go for much less. This kind of scenario is dangerous for me because whenever I feel like I'm getting a deal, I tend to go overboard. 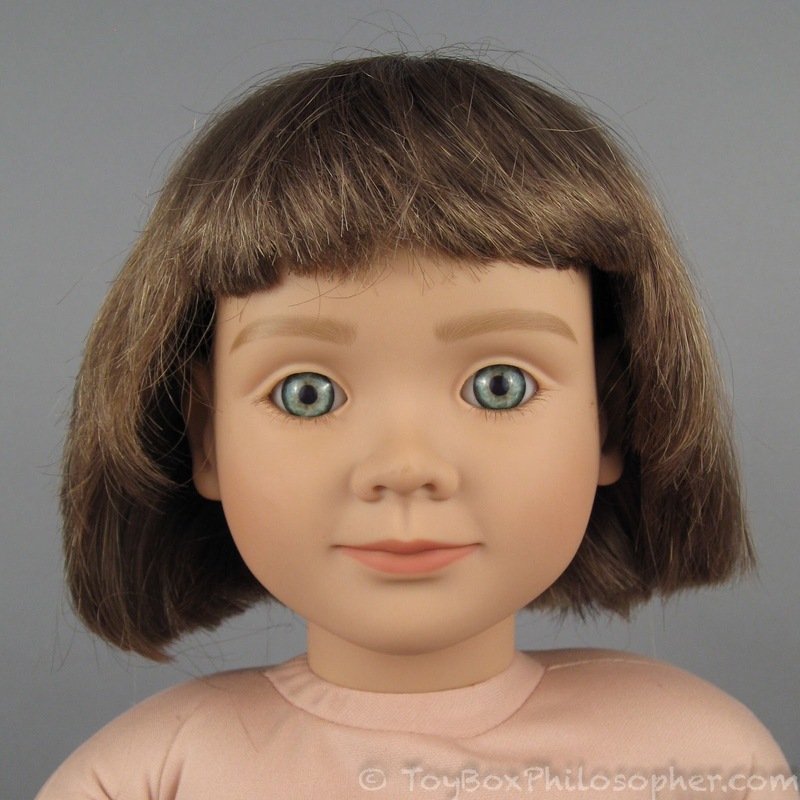 Long story short--and in my typically obsessive way--I ended up with three dolls. Let me introduce them to you (all shown exactly as they looked right out of their shipping boxes). Holly was made in 1999. Incidentally, you can tell the manufacture date of a My Twinn doll by looking at the body tag. Most dolls also have a date stamped on the back of their neck (often 1996 or 1997), but this date tells you nothing about when or where the doll was made. For more information about the neck stamps, see this helpful page from Logan's Ladies. That's the date you're looking for. 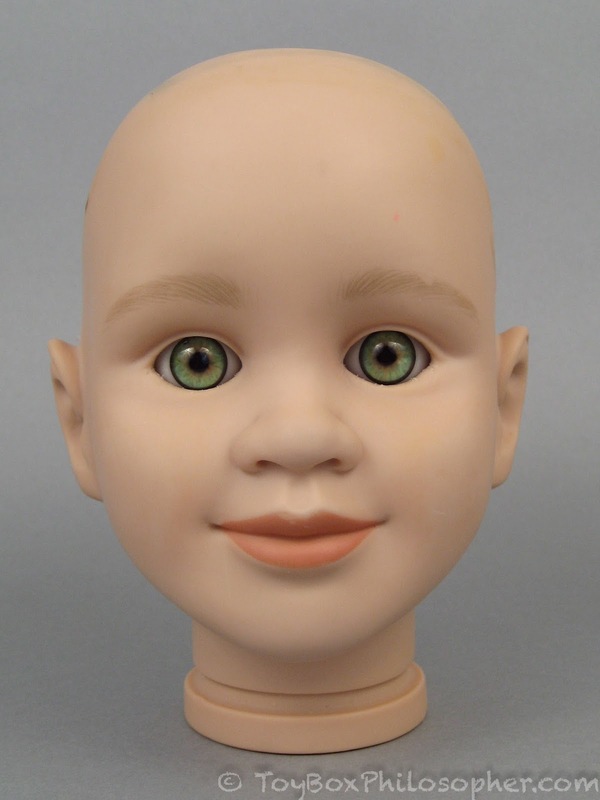 Because the neck dates all fall within the Denver production period (1995-2001), some eBay sellers will cite this date and claim that they have a Denver doll (and charge accordingly) without ever looking at the body tag. 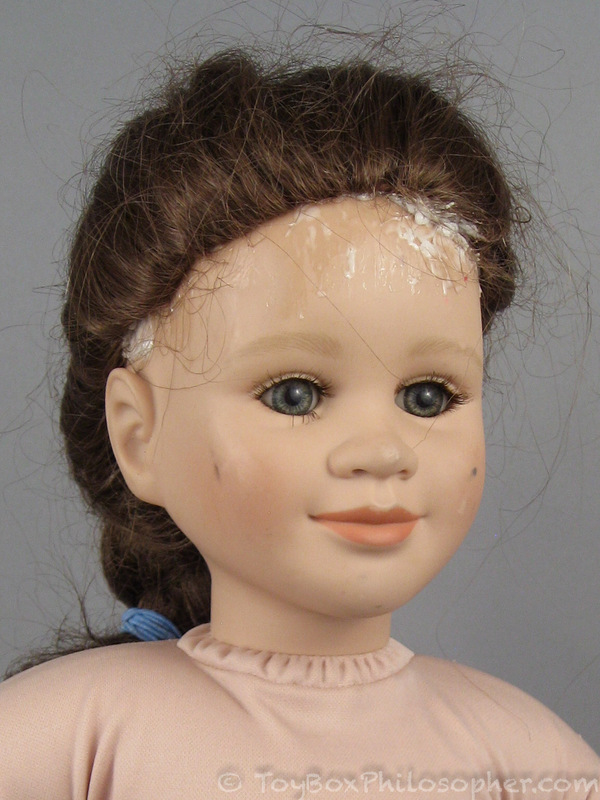 They're not necessarily doing this to be sneaky, many vintage dolls are valued by their neck marks. Worse, though, the seller will show a post-2001 body tag and claim the doll has a "Denver head" simply because the neck date is 1997. This is not a valid conclusion. I suppose a body-swap could have occurred at some point in a doll's history, but typically--especially for dolls that show their age--the body tag dates are accurate. 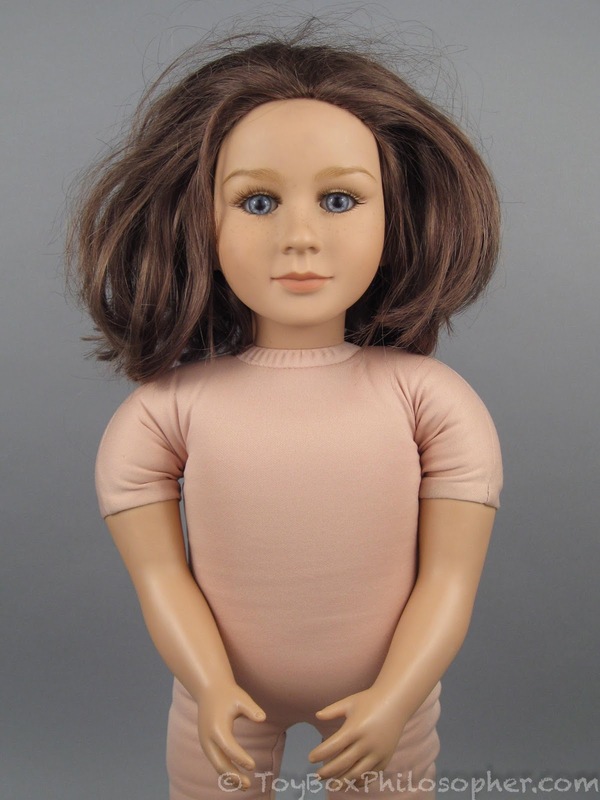 If you really want a Denver doll, always ask to see the body tag date. If the body tag doesn't match the claim of the seller, ask about the history of the doll. 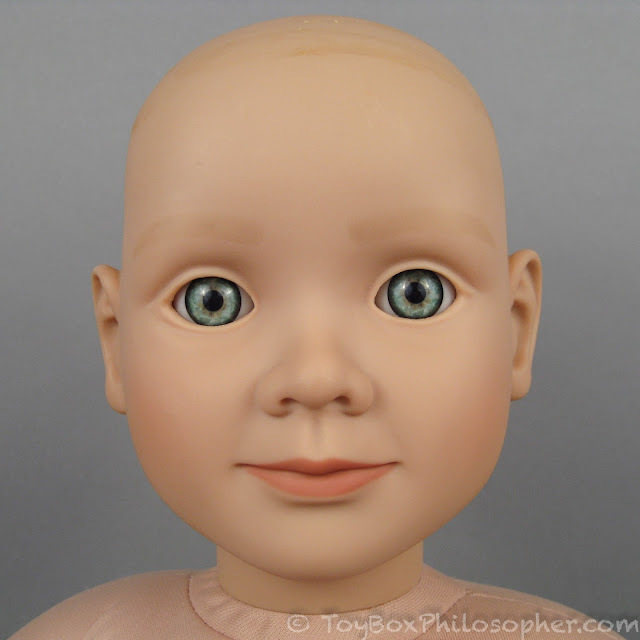 Occasionally you might come across an actual Denver head that has been re-bodied. But, again, you can't tell this by just looking at the neck date. 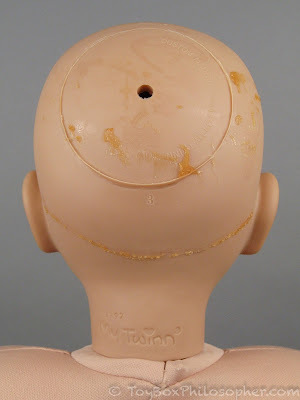 I'm certainly not an expert (and I would have a hard time identifying some Denver heads if they were disconnected from their bodies), but I've found that it helps to approach the My Twinn secondary market armed with a bit of background. 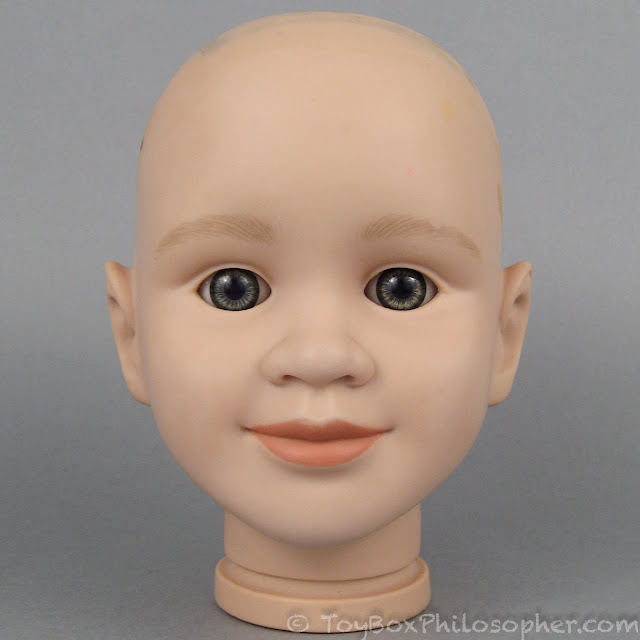 Incidentally, if anyone knows--definitively--how to identify a Denver head without its body, I'd love to learn! I just look at the eyes and eyebrows and make a guess. Anyway, back to Holly. 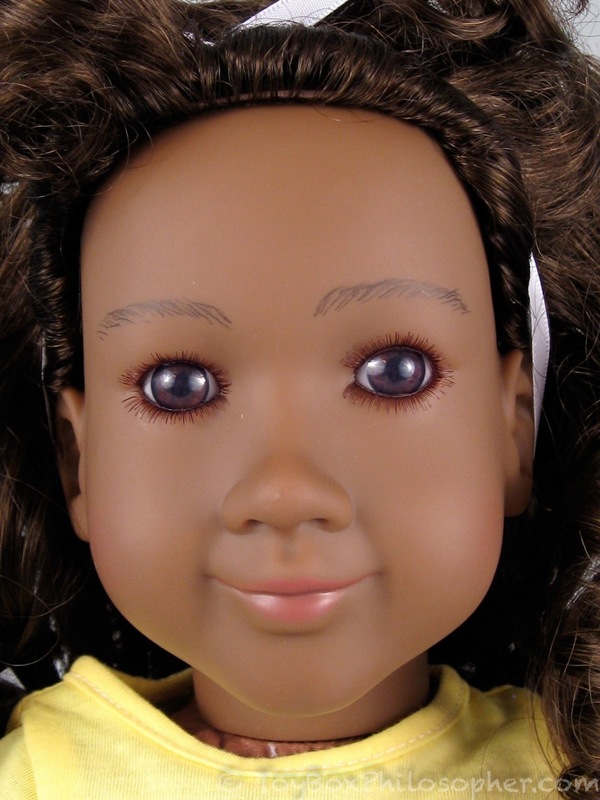 She has the "Danielle" mold, which is my favorite My Twinn face. The 23" My Twinn dolls in my collection typically keep the name of their face mold as their official name. 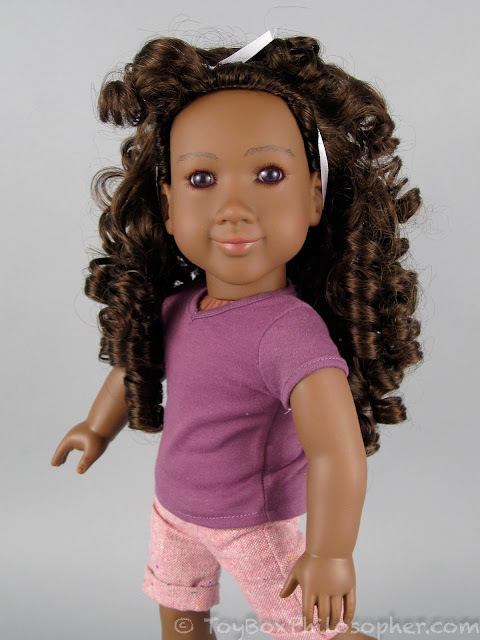 But since I already have a Danielle, this new girl had to be called something different. She looks like a Holly to me. 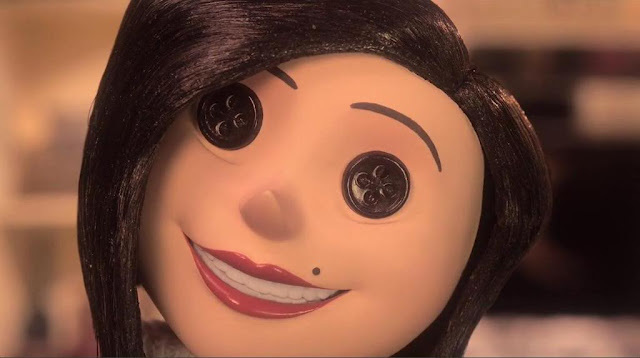 I meant to purchase a doll with a face mold that I didn't already have, but...well, I find it tough to resist the Danielle face. Sadly, she does not have distinctive eyebrows. If you look really closely at her eyebrows you can see that the brush strokes are delicate and carefully done, but the overall shape of the brow is really blocky and generic. 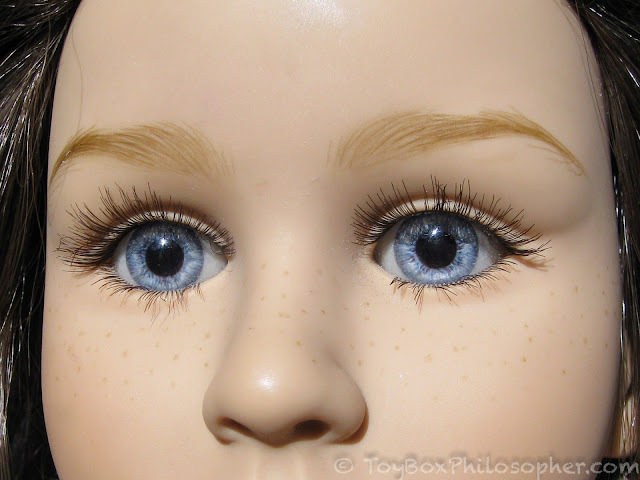 Now, after seeing the brows up-close, I'm starting to think about the possibility of maybe re-painting Holly's eyebrows. I hope that's not a terrible idea. I won Audrey for about $30, which seems like an incredible deal to me. In fact, I was pretty sure I wouldn't win the auction at all (my max bid was only $40). She really doesn't need much work. 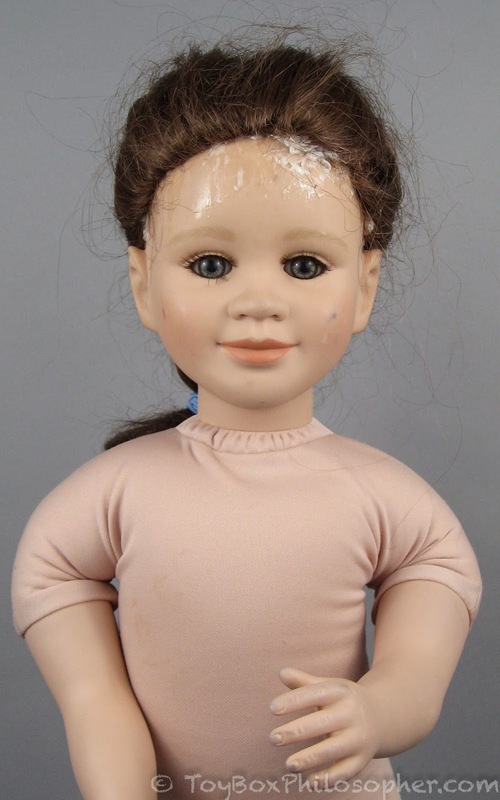 She's dirty, her eyelashes are damaged, and she might need a new wig...but that's it. 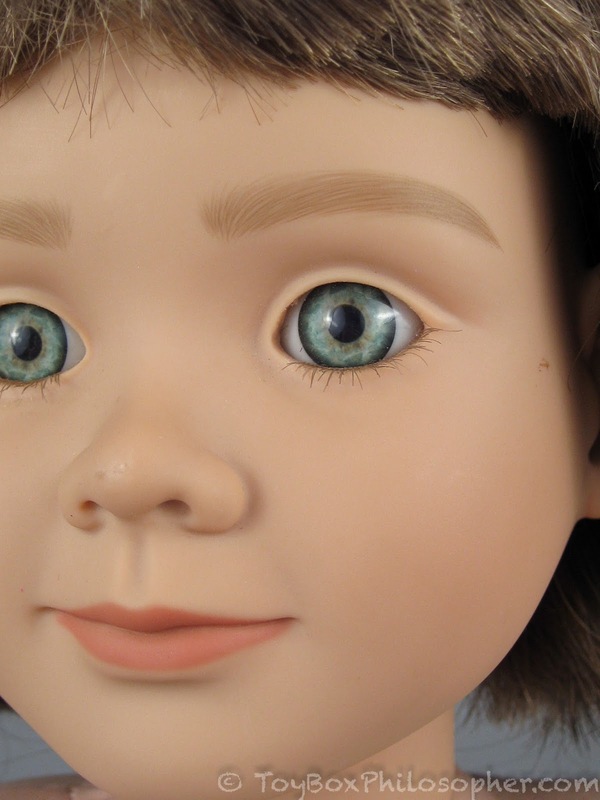 This doll's eyes look blue in pictures, but in person they have a faint purple cast. 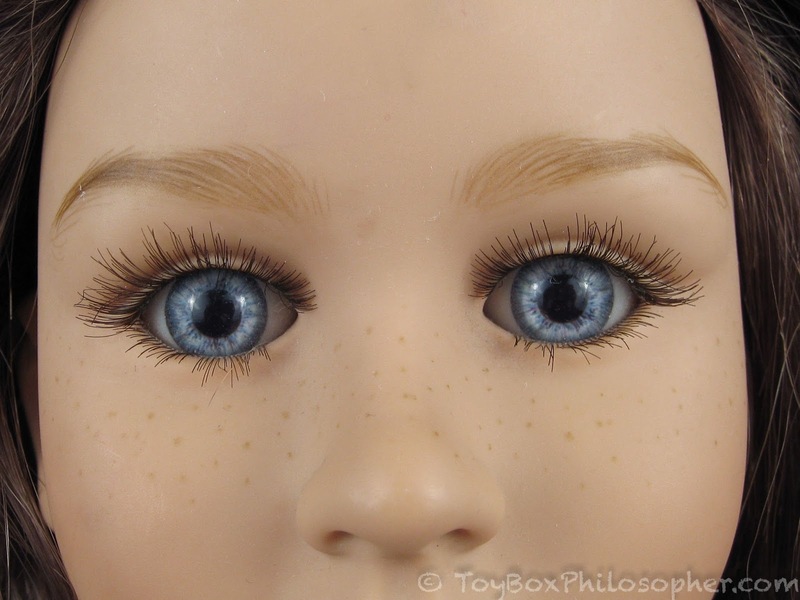 This is not my favorite color (my Denver Kate doll has these same eyes). I started to wonder if Audrey would need an eye-swap? That's a huge undertaking. These eyes photograph beautifully in every kind of lighting. 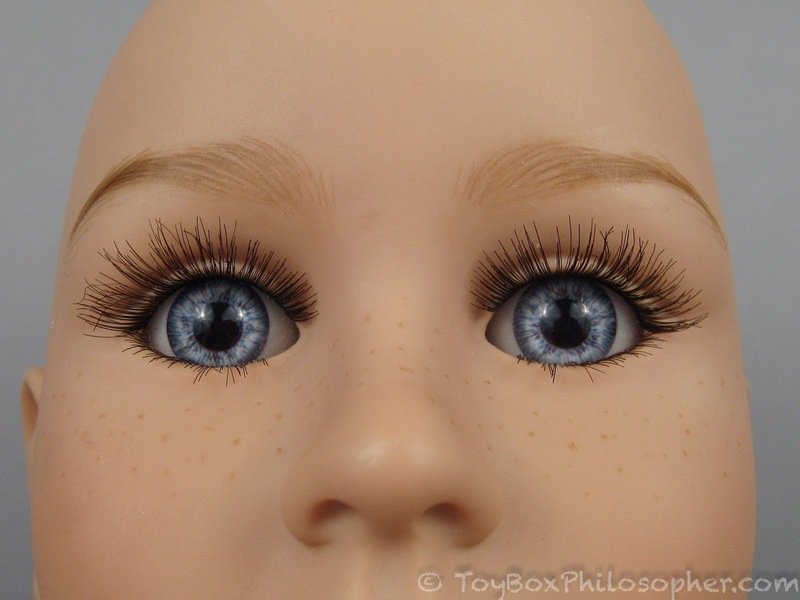 They're also very sparkly and realistic...so I think I'll avoid an eye swap on Audrey. Phew! My husband refers to this one as Glue Girl. 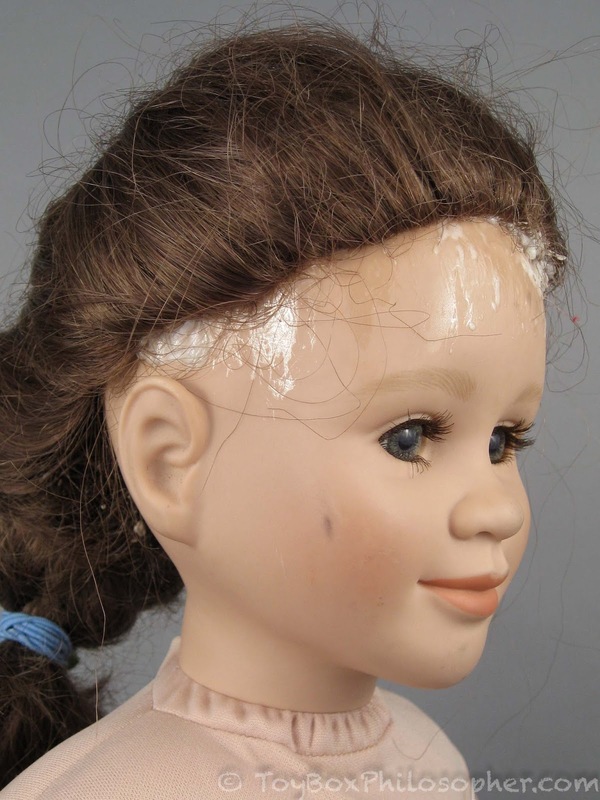 I could see from the auction photos that Glue Girl is from 2001, but I couldn't identify her face mold (there were no front-on pictures of the head). I thought she was an Emma, or maybe Doris. It was an addictively fun mystery to think about. 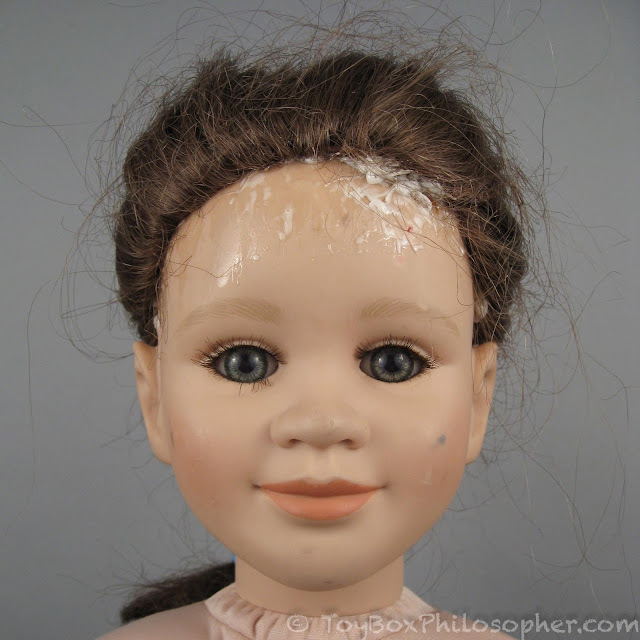 It might have been silly to pay for a doll in this condition, but there was just something very appealing about her happy face...and she seemed in desperate need of help. Which, by the way, is the rationale by which most of our pets have joined the family. I got her for--again--about $30. It's so weird that she and Audrey sold for the same price! 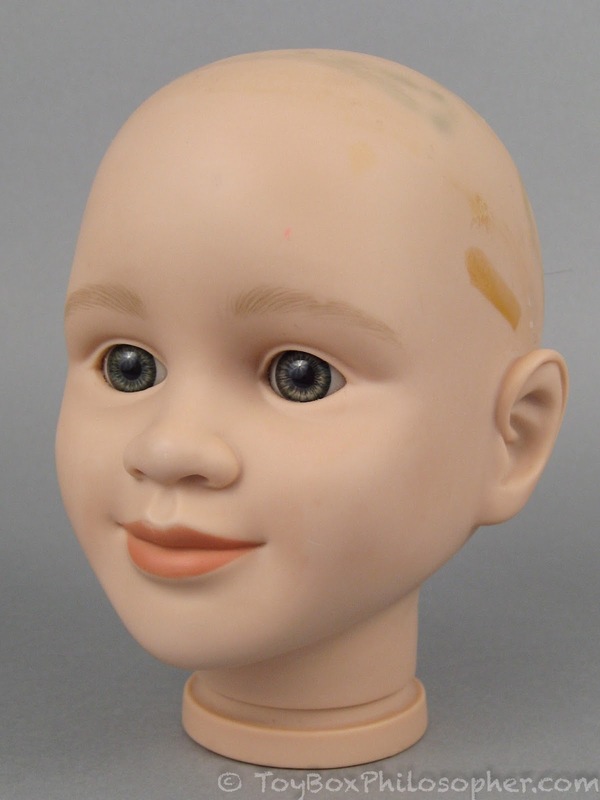 In person, I know for sure that this is the Tasha face mold. I do not have a Tasha yet, so I was thrilled with this discovery. As perhaps you've guessed, Tasha is going to be the star of this project. She's lovely, but she needs a lot of work. 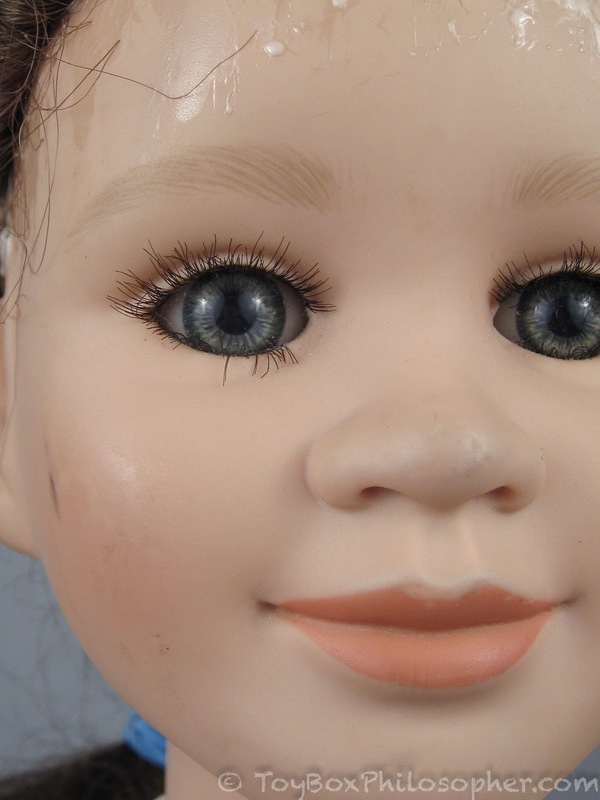 When I purchased Tasha, I was braced for the fact that she might need everything fixed (vinyl cleaning, deep body cleaning, re-wigging, eyelashes, paint...). The one thing I didn't think she'd need was new eyes. 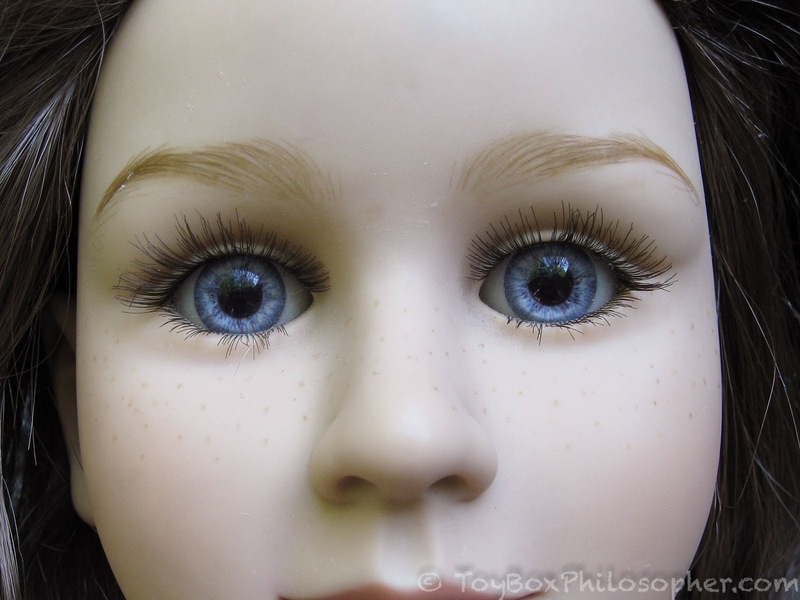 Her eyes looked beautiful in the pictures, in fact, I pretty much bought her because of her gorgeous dark eyes. 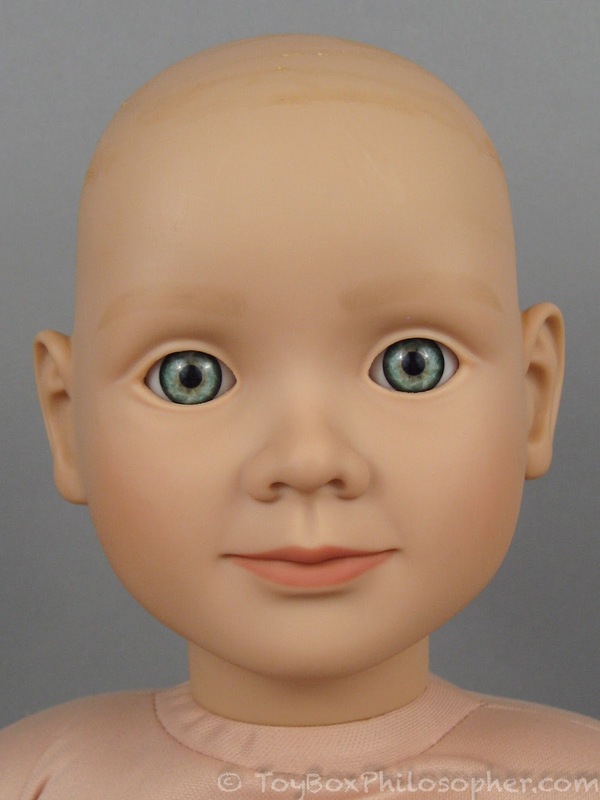 Without any knowledge of the type of glue, I wasn't sure I'd be able to do anything at all with this doll. The eyes also lack the luster that's typical of My Twinn eyes. Overall, Tasha looks a little tired to me. And no wonder, I suppose. She's clearly been on some epic, harrowing adventures during the last 15 years. I wish she could tell me about them. I took Tasha outside to see how the eyes look in natural light. This lighting shows off the defects in her vinyl really well, too. 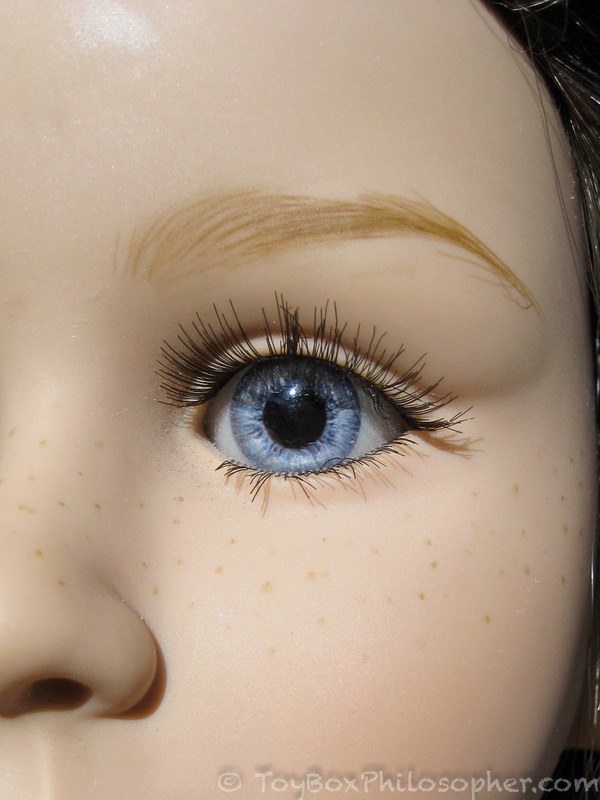 Her eyebrows are delicately painted and have a great shape, they're just very faint--and missing a patch over that left eye. The pleasant surprise was that her cloth body is very clean and has no odor. Spot cleaning the body will be more than enough. Fixing these three 23" dolls would have kept me plenty busy for the next week or so. 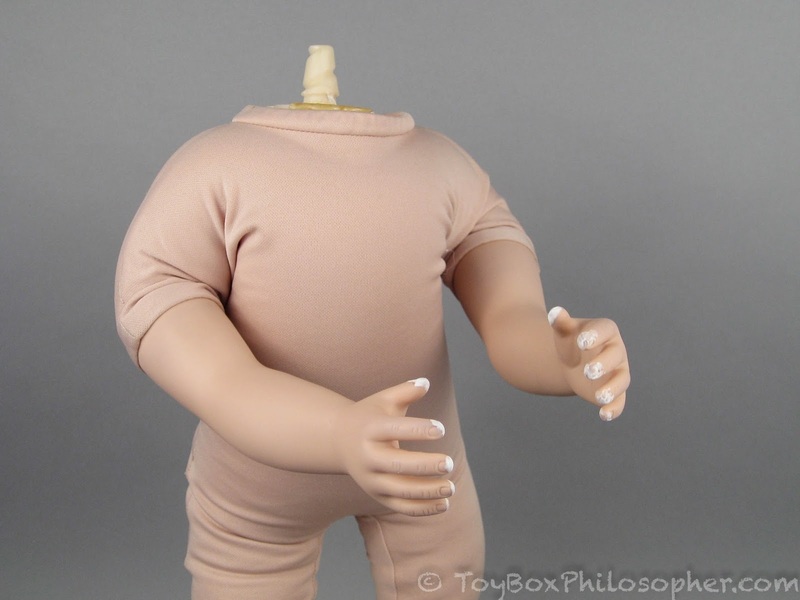 However, a few of the My Twin dolls I already own also have problems. 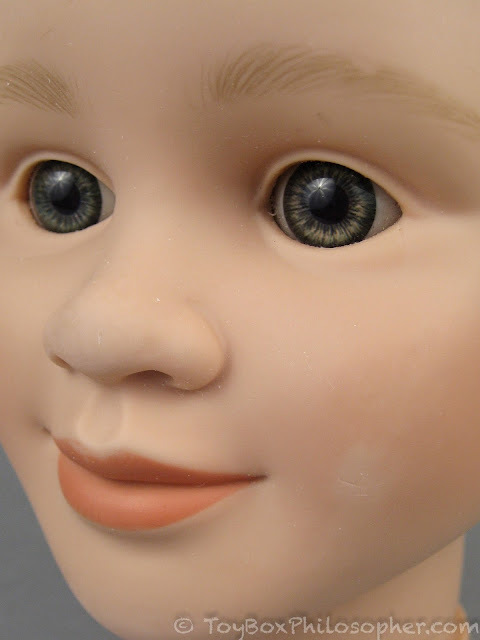 Perhaps you remember that my 18" Kate-faced doll, Frances, had eyes that were turning purple back in 2014? Well, now all of my 18" dolls have cloudy or discolored eyes. I gather that this was a pervasive problem among the smaller My Twinn dolls, and probably (although this is just speculation) a contributing factor to the company going out of business. I love her impish smile! I enjoy brains for breakfast. 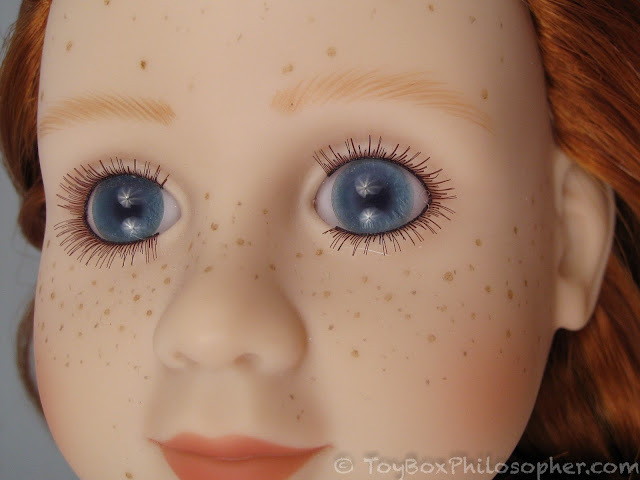 Her eyes went from lovely deep brown to cloudy, pink-ish zombie brown. It's awful. 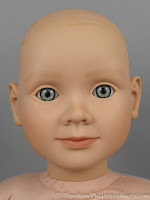 In 2014 she had the most realistic hazel-green eyes. I think I actually complained that her eyes were too dark back during that original review. I should have enjoyed them while they lasted. She has really nice eyebrows, too. Her eyes are a cloudy, pale blue. They look dead. It's really creepy and depressing. 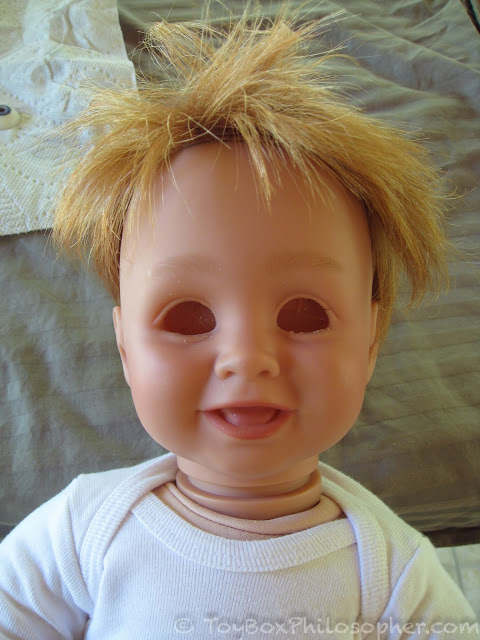 These 18" dolls are ruined unless I can fix their eyes, so the My Twinn Project will also include swapping the eyes (or trying to, anyway) on all of these smaller dolls. There's a lot of work to do! I'd better get started. 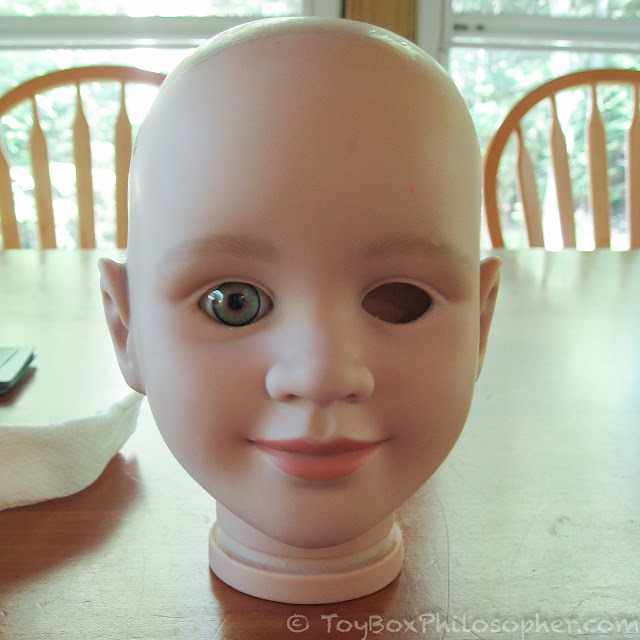 The two things in this project that I found the most daunting were removing Tasha's wig and extracting all of the eyes. So...I decided to start with those things. 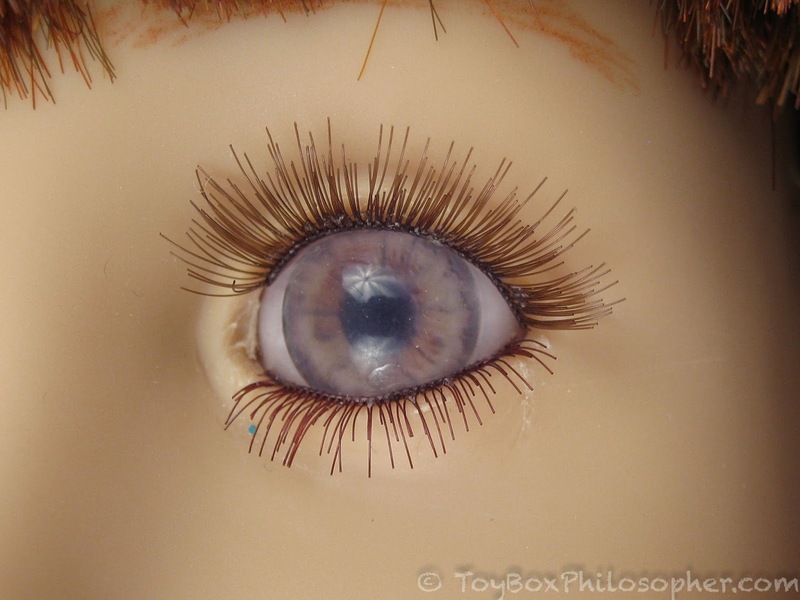 I pulled off Tasha's remaining eyelashes with a pair of tweezers. Then I turned my attention to the wig. ...which was allowing water to leak in. 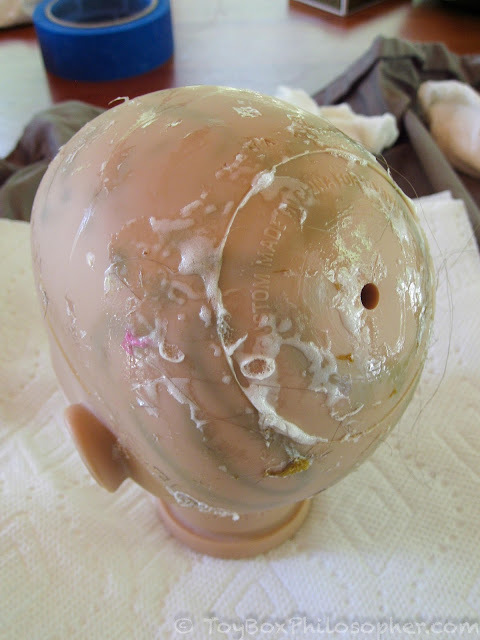 I'd been determined not to get water inside of the head (mold can grow in there over time...), so this wasn't a great start to the project. I worked quickly to remove the head and drain it. I snipped the cable tie and pulled it out. Underneath that yellow foam is a segmented plastic armature. Logan's Ladies has some great pictures if you're curious. Tasha's head was easy to pry off because that glue is old and wasn't holding on very tightly anymore. 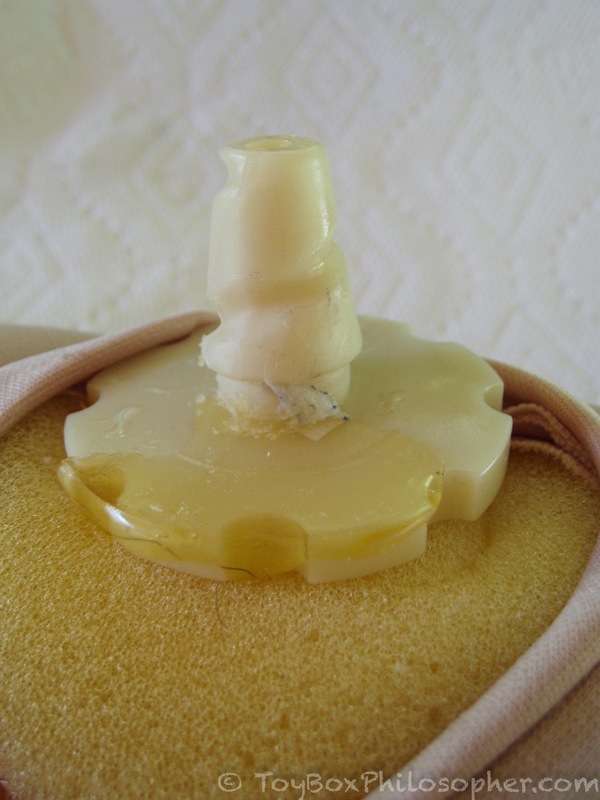 To be on the safe side, I used a large screwdriver and inserted it between the head and the neck disc, gradually working around the neck to free the head. The head was much easier to work with after it was detached from the body, so I'm kind-of glad that I made the mistake of soaking the head. With the body safely out of the way, the first thing I did was wash the entire head with some mild soapy water. This removed a lot of the smudges and smaller spots of dirt. It also helped loosen some of the glue globs. I grabbed a pair of tweezers and started to pick and pull away the bits of white, foamy glue. This was a painstaking process. 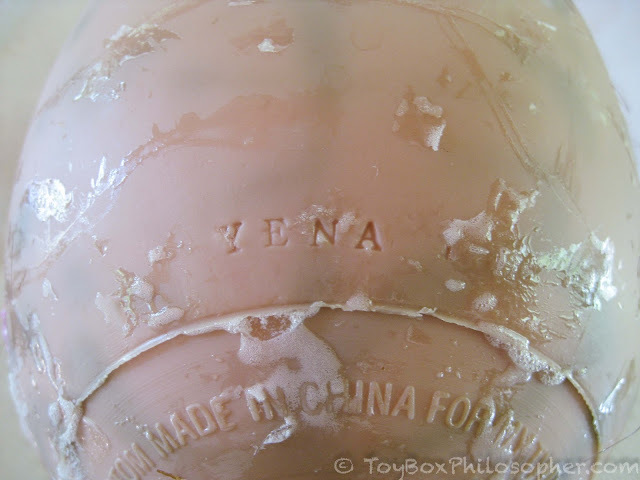 My Twinn gave many of their head molds names, but these names were not part of the marketing. They were (literally) hidden away under the wigs. My Twinn collectors catalogued and named the face molds to help keep track of them (there were more than 42 faces in total) and these names are the ones that have stuck over time. Tasha's My Twinn name is Yena. I tried soaking a paper towel in water and leaving it on her head for a while to soften the glue. This worked pretty well for the larger streaks. I could insert some nice spa treatment analogy here, but it's tough when poor Tasha is separated from her body. While she was soaking, I inspected the damage on the rest of her face. She had two deep gashes in her vinyl and two very dark spots on her face that would not wash away with soap and water. I found some very fine grain sandpaper (600) in my garage and tried this on an inconspicuous area of the head to see if it would leave marks. 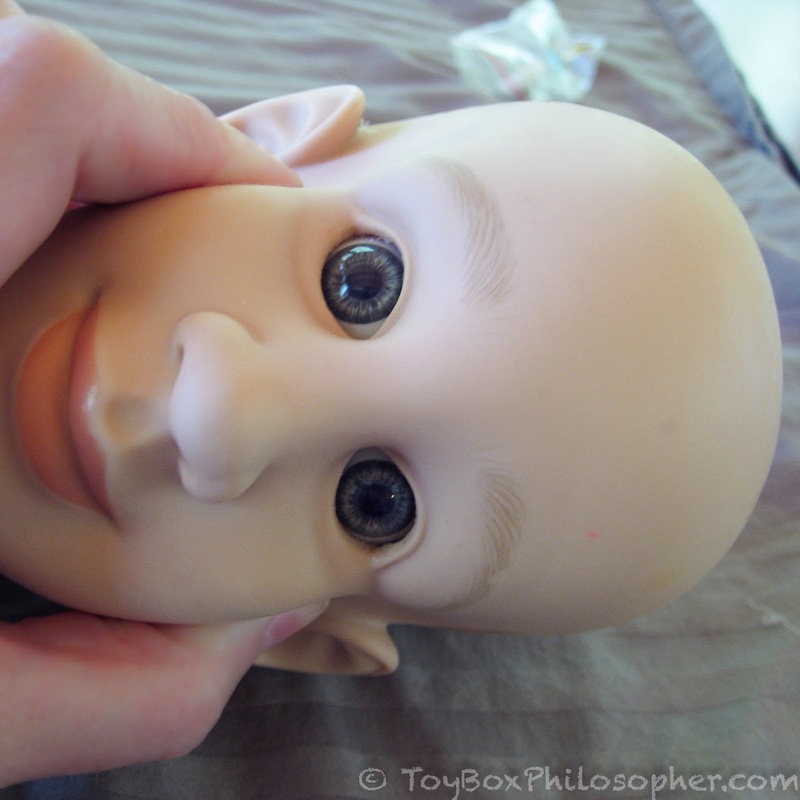 I was pretty happy with the sanded finish, so I crossed my fingers and started to sand the doll's cheeks and nose. I used very light pressure and worked in small circles--alternating direction every so often. I ended up sanding down the two vinyl defects a little bit. I also used the sandpaper to remove the two stubborn dark spots on the cheeks...and the smallest streaks of glue on the forehead. 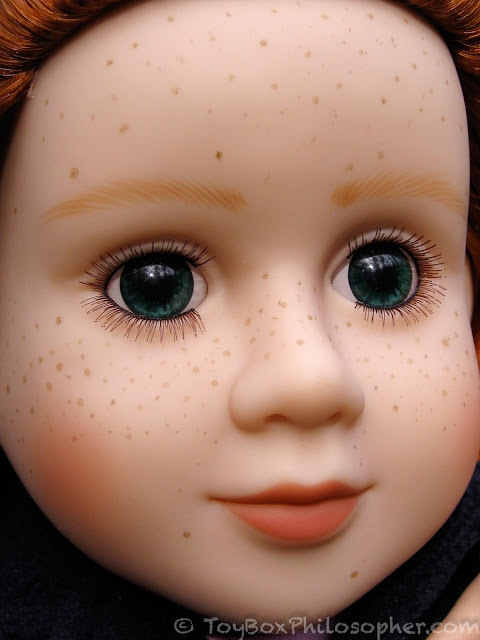 The mismatched eyes are really obvious with those eyelashes gone. There's a pink spot and a dark stain on her forehead that I could not remove. Not only does the face look better now, but it feels amazingly smooth! I'm very impressed by the quality of this vinyl. 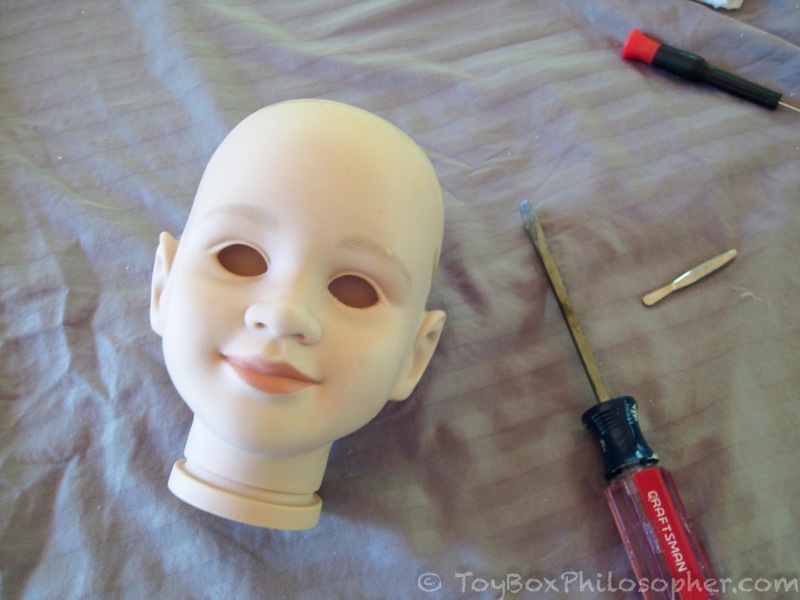 I have no idea if this sanding technique would work on the newer dolls, but it worked beautifully on this 2001 doll. I see now why this older vinyl has been likened to porcelain. Ok, quick warning: this next part--where I remove the eyes--might give some people the heebie-jeebies. 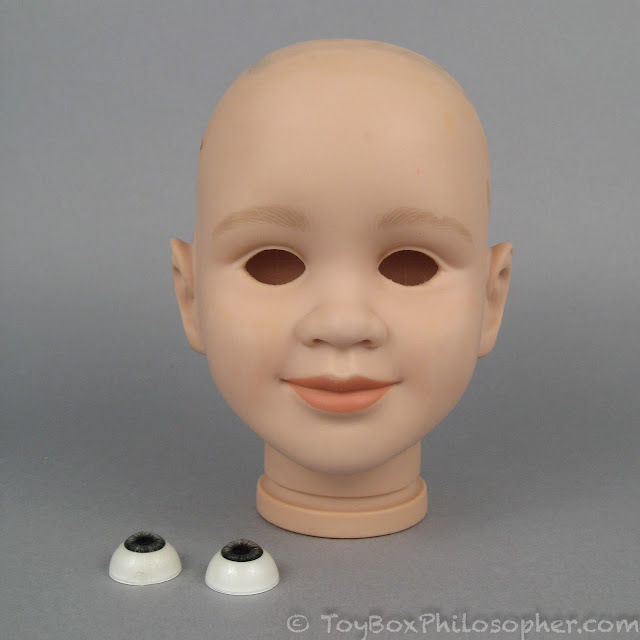 The Logan's Ladies website has a great tutorial for removing My Twinn eyes. I read this very carefully several times before I got stared...and I'm glad I did. 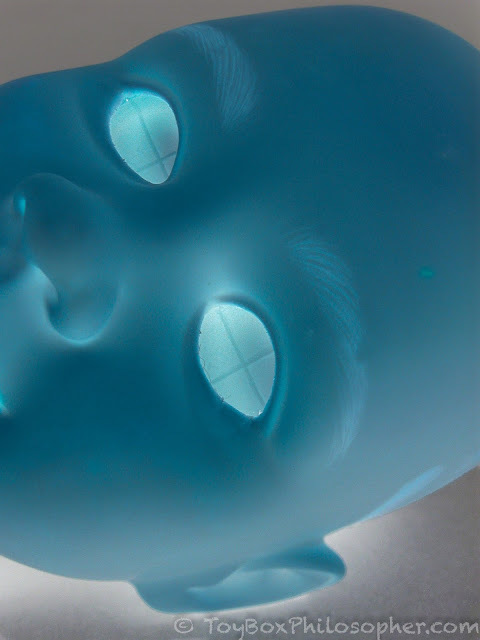 My Twinn eyes are best removed from the front of the head. Honestly it never would have occurred to me to try this technique. 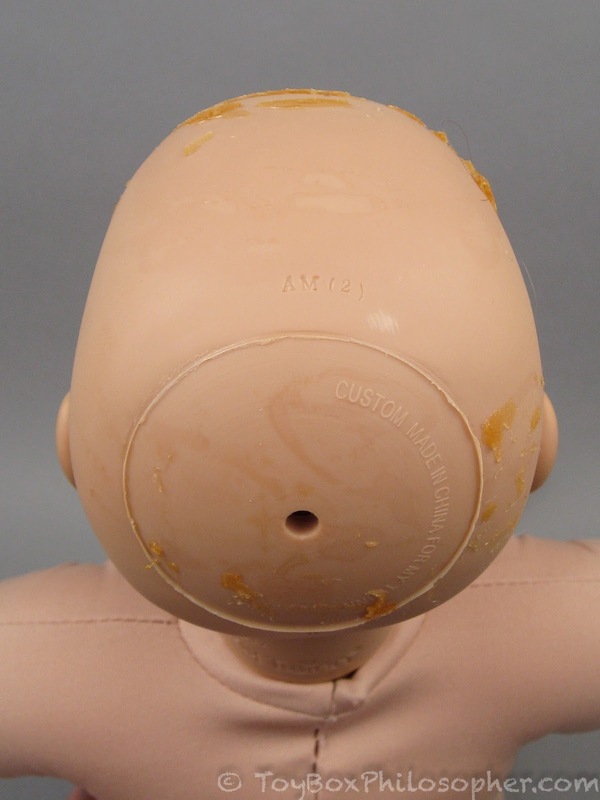 In my limited experience with removing eyes, I've only ever approached them by cutting a hole in the back of the head (like I did with my Masterpiece Snow White). 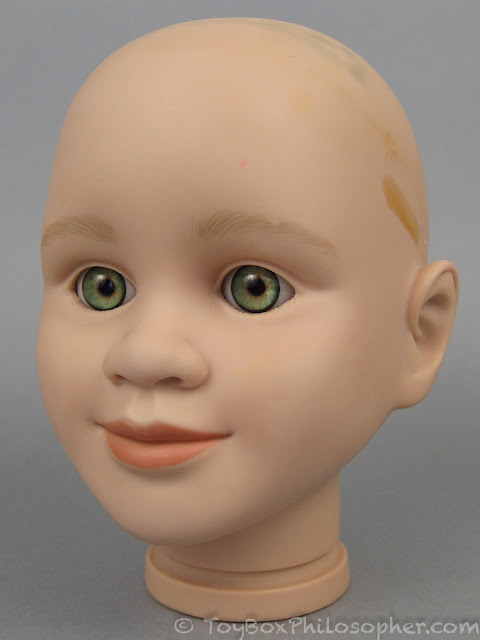 Logan's Ladies also recommends practicing on a few dolls before attempting an eye replacement on a valuable or beloved doll. Tasha certainly isn't valuable, but I'd invested a lot in her at this point and didn't want to mess her up. I was also getting really attached to that cute face. 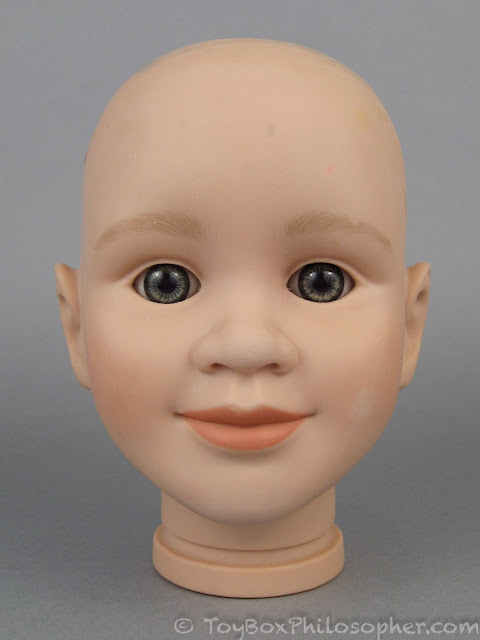 Fortunately, I happened to have a My Twinn baby kicking around in the garage. I ordered this fellow from eBay several years ago. He was in the garage because I freaked out when I de-boxed him and saw his eyes in person. 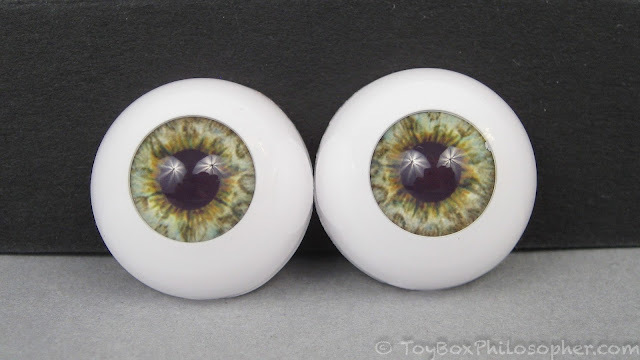 They looked like nice hazel eyes in the auction pictures, but in real life they're very buggy, faded and freaky. He never made it inside the house. The constantly startled expression makes me jumpy. This guy is from 2005, so I was a little concerned that his newer vinyl might not hold up to heat and stress as well as the Denver vinyl. 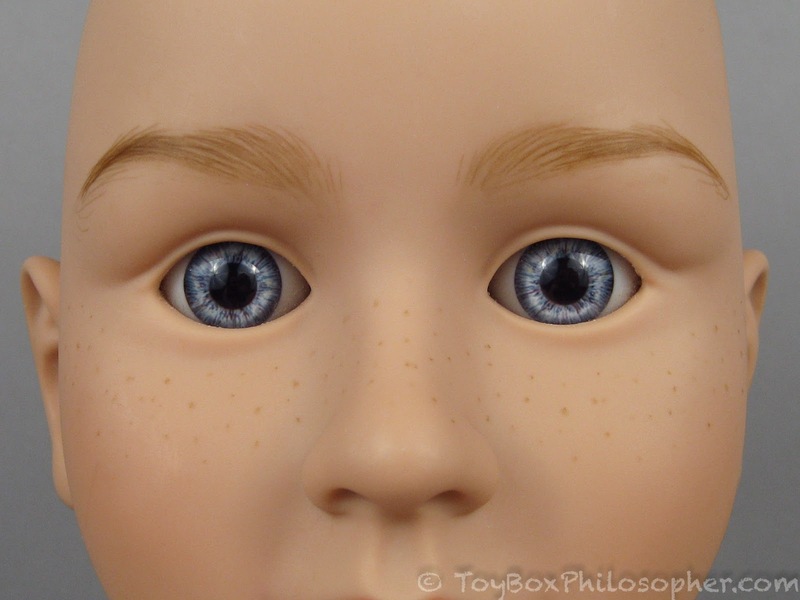 Apparently, some of the newer dolls will crumble if you try to pry out their eyes. That reminds me of my Masterpiece Snow White's crumbling vinyl. 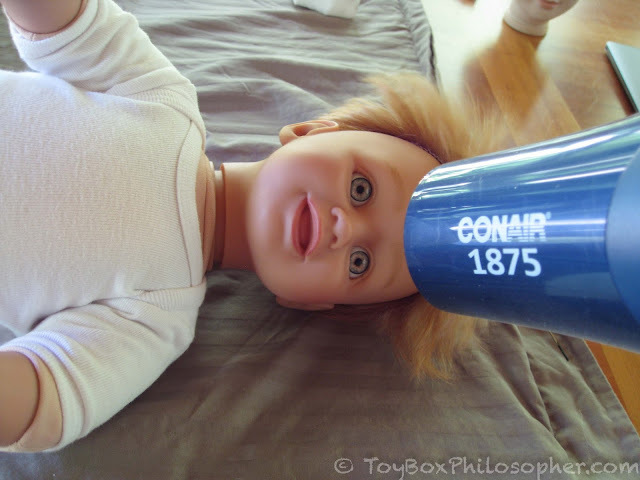 I would never try this technique with a doll like that. Now he has good reason to be startled. I'll admit that startled eyes are better than no eyes. Another rookie mistake I made was to not heat the head up for long enough at first. It really has to be squishy and stay squishy throughout the whole process. Doing one eye at a time made this easier. 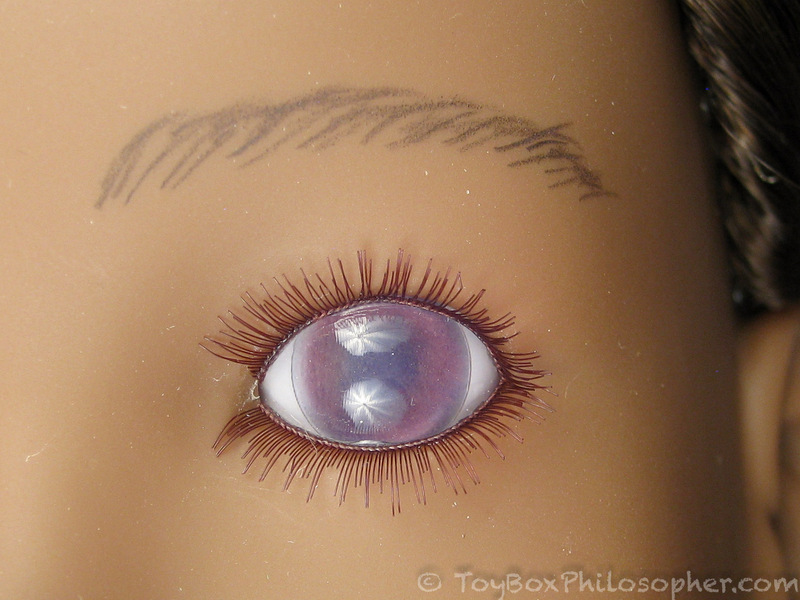 I wasn't really prepared with supplies to replace eyes on this size of doll, so I rooted around in my old sculpting bin until I found some Eyeco SoftGlass (silicone) eyes that are the right size (22mm). 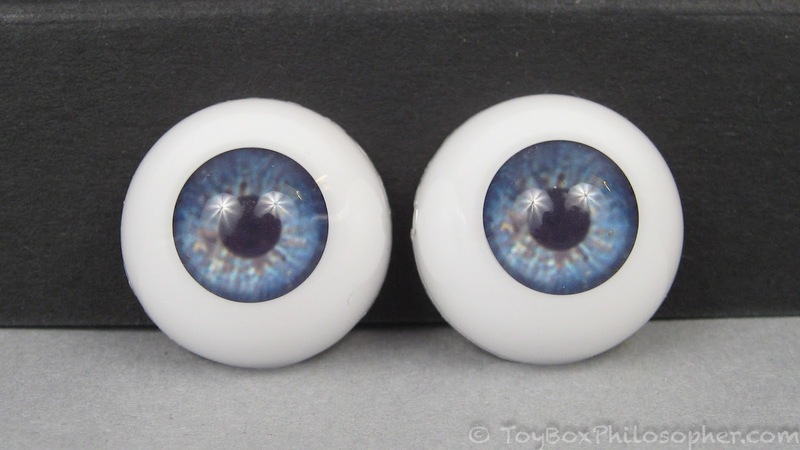 Silicone eyes pop into the sockets really well because they're rubbery and bendable. I don't know how these eyes will react with the My Twinn vinyl over time, though. I do know that they attract lint and dust like nobody's business. I prefer glass or acrylic eyes. But I just pushed and squished them around until they were straight. I won't have this luxury with rigid acrylic eyes. Hey! That's a cute baby! That's where the screwdriver was pushing. They each melted and were crushed to some degree. I actually like him a lot now. Maybe he can have some clothes and move in from the garage? Armed with this experience, I tried the same procedure on Tasha's head. Usually My Twinn heads aren't compressible. I never thought I would be doing this to a doll. 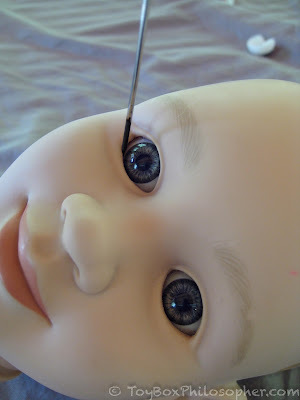 The challenge is to get the eyelids soft enough so that the screwdriver can be stuck up underneath the lower edge of the eye. It's brutal. Once my screwdriver was in place (which took forever), I pulled it forwards and the eye popped out and went shooting across the room. Then the dogs tried to eat it. There was a lot of excitement. 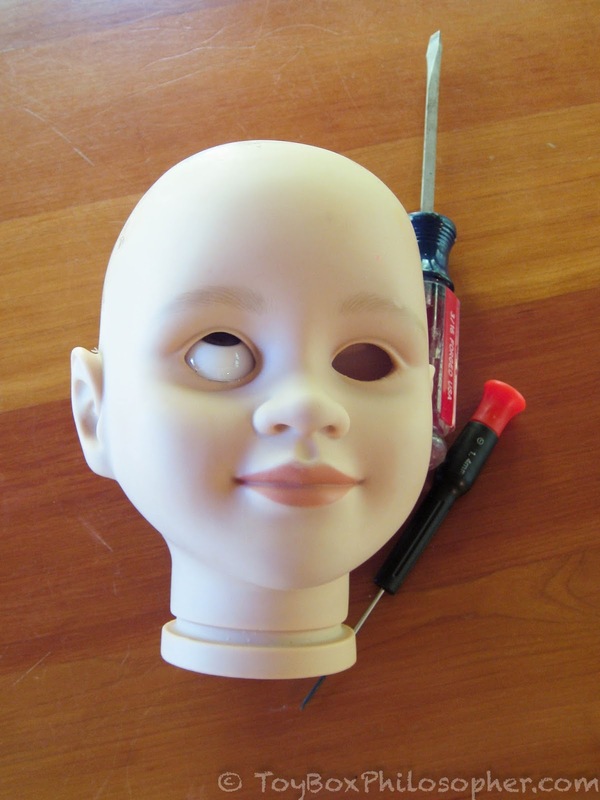 It's fascinating to me how much personality is lost when the eyes are gone. I'm reminded of my Little Apple doll, Erro. The empty sockets are made extra-spooky by the fact that they have crossed lines at the back that look like Xs. The negative of this picture is even creepier! Sorry. 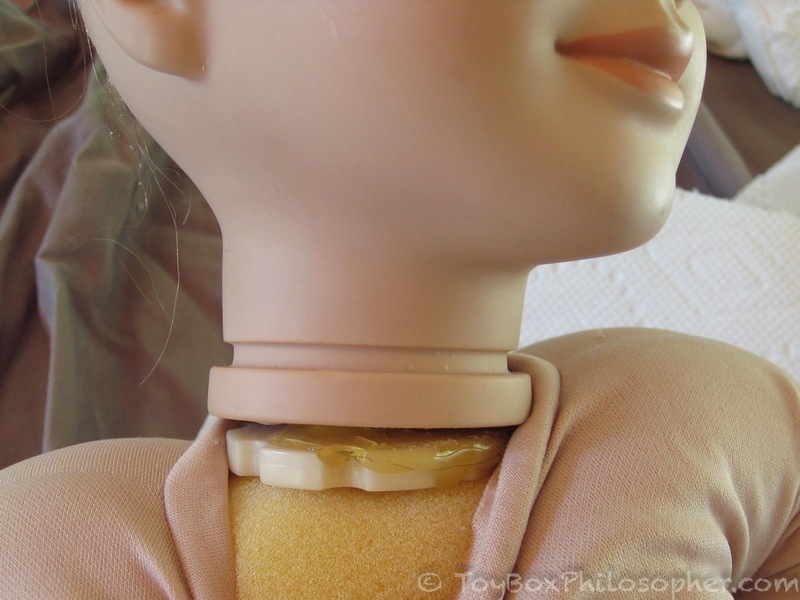 There's more doll horror in this post than I anticipated. 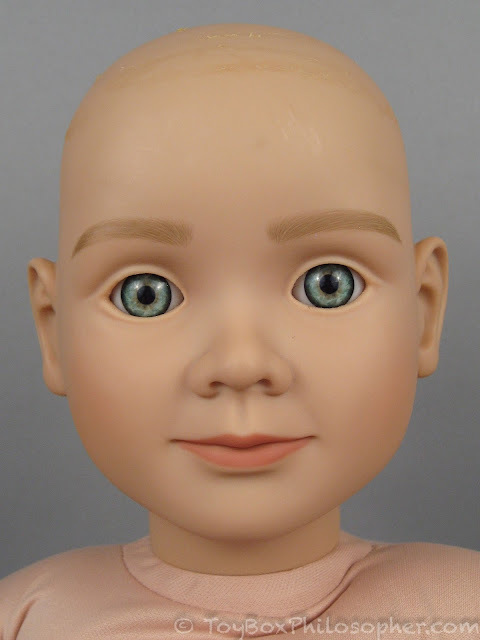 The older, Denver-era eyes are apparently made out of stronger stuff than the newer eyes I pulled out of the baby. They did not crack or damage in any way as a result of the heat and stress. 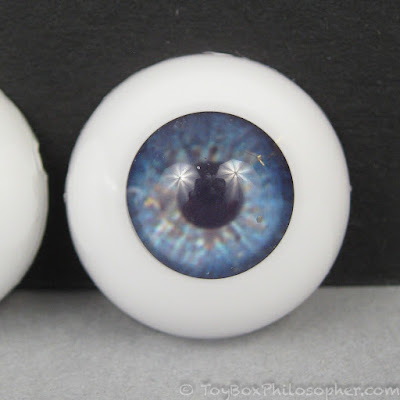 I ordered multiple pairs of new (20mm) eyes so that I would have a few options for replacement. 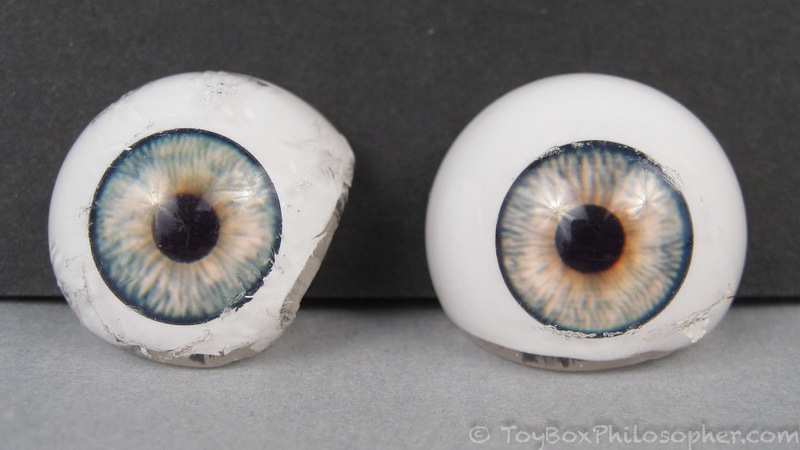 I chose several pairs of Secrist Real Eyes and two sets of Eyeco PolyGlass eyes. 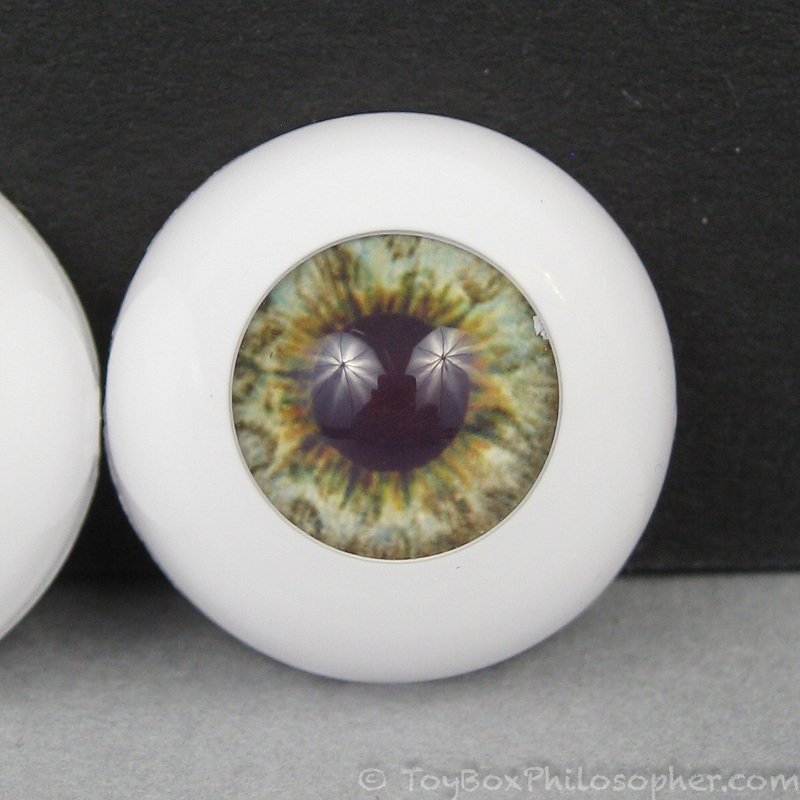 It's really hard to tell what the eye colors are going to look like in real life. I'll quickly show you the eyes I bought in the hopes of helping someone else who is trying to choose colors. Secrist Real Eyes "Dark Blue Dusk." 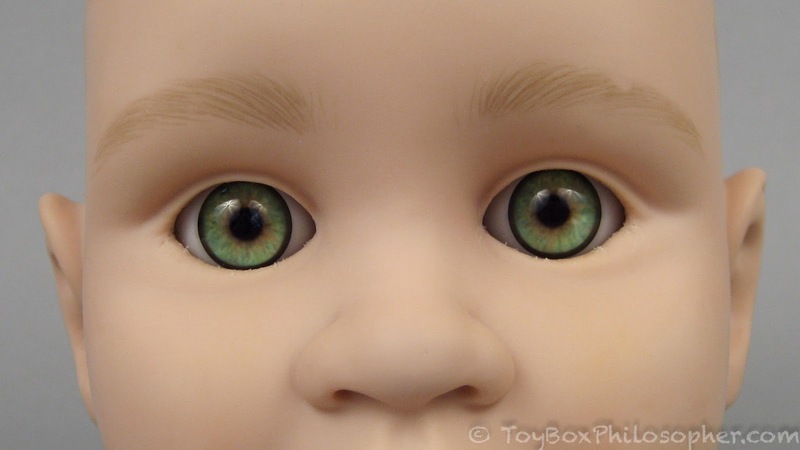 Secrist Real Eyes "Dark Brown Green." Secrist Real Eyes "Ocean Green." Dark Brown Green was my favorite of these, Ocean Green was my least favorite. The Eyeco eyes have a slightly higher dome on the iris, and the tip of the iris has a section of acrylic that distorts the color of the eye in profile. 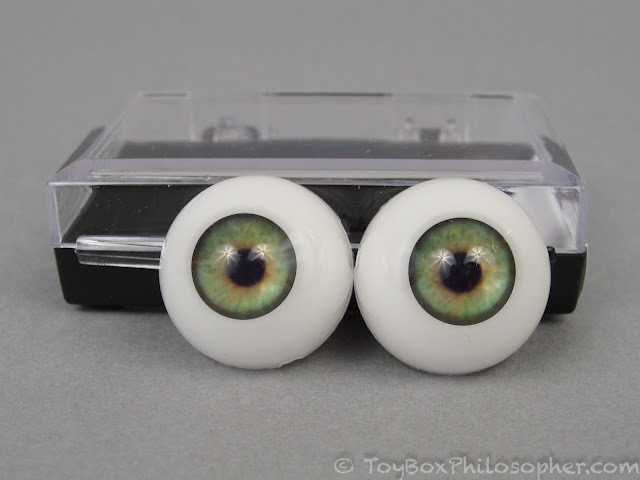 From left: My Twinn eyes, Secrist eyes, Eyeco eyes. 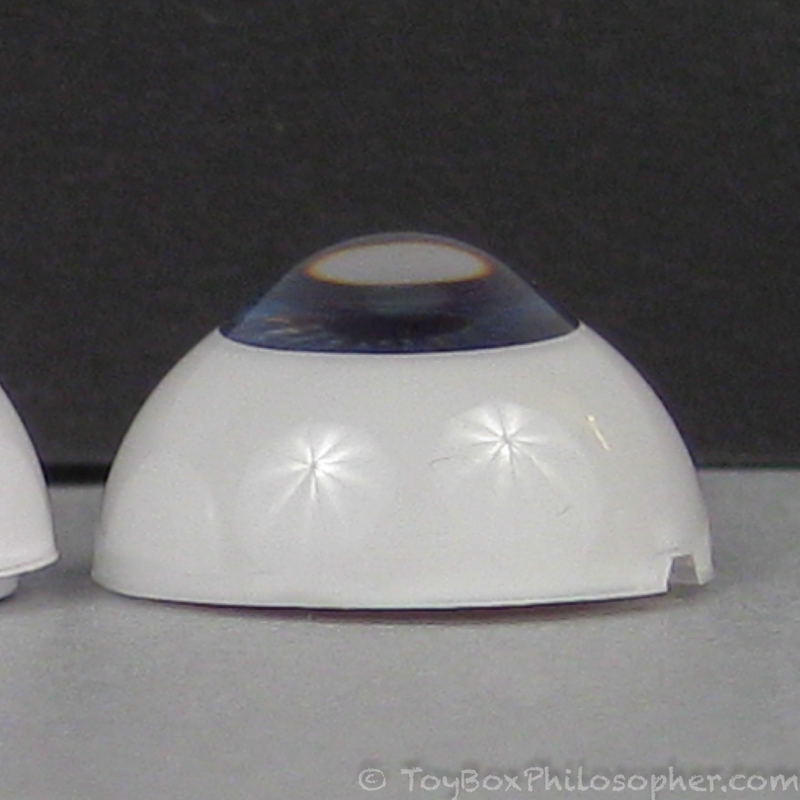 It seems to me that the colors and patterns on the Eyeco eyes are less vivid because of this style of dome. These pictures are in focus--promise--it's just that the iris pattern always looks blurry. Despite the funny optics of this brand, I ended up settling on a pair of Eyeco eyes for Tasha. ...but then I had a heck of a time getting that bottom edge to snap into place. It was very hard work. I ended up using the same large screwdriver to pull down on the lower eyelid while simultaneously pushing up on the eye (and sweating a lot). I found it extremely necessary to keep the head nice and soft for this part of the procedure. And then I was ready to quit. 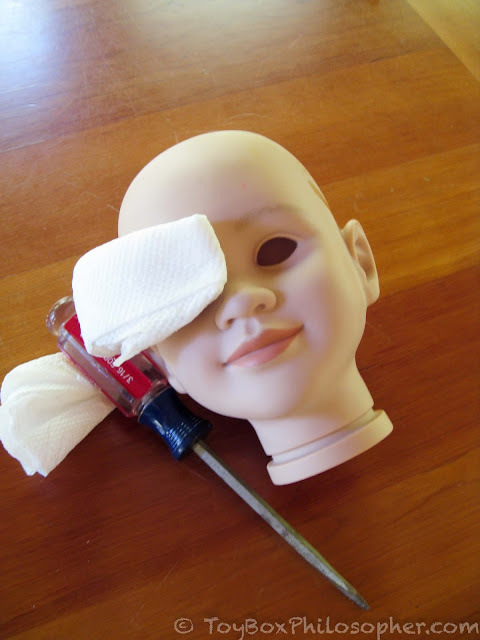 I covered the inserted eye with a damp paper towel before heating the second eye socket. 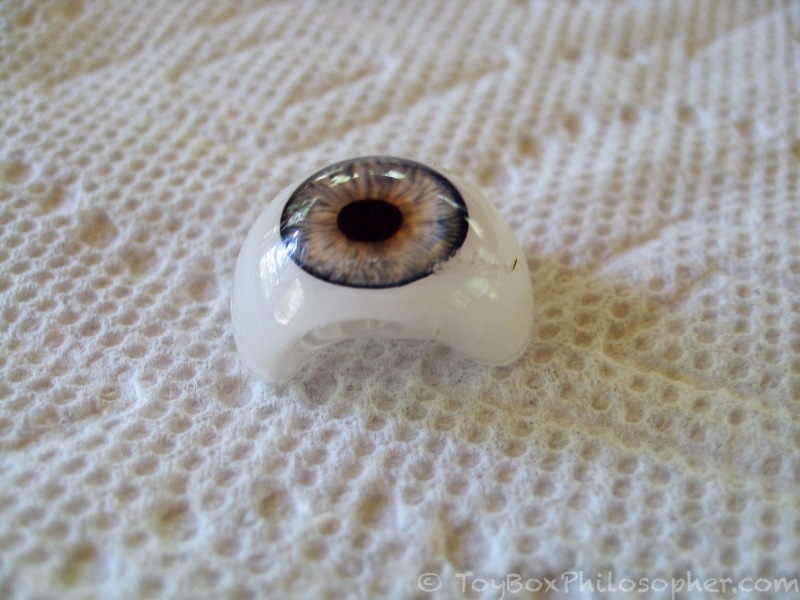 These newer acrylic eyes can withstand quite a bit of heat (275 degrees), but I covered the eye just to be safe. At this point, melting an eye and having to re-do everything would have been a huge drag. This was a tough job. It didn't help that it was about 90 degrees outside and I had a hairdryer running right next to me. But even without the heat, there was more physical exertion required than what I expected. 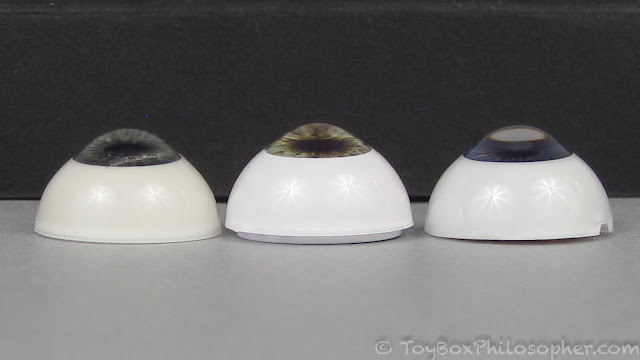 I have to say that I'm not looking forward to replacing three more sets of eyes...but I suppose it's possible that I'll get better with practice. 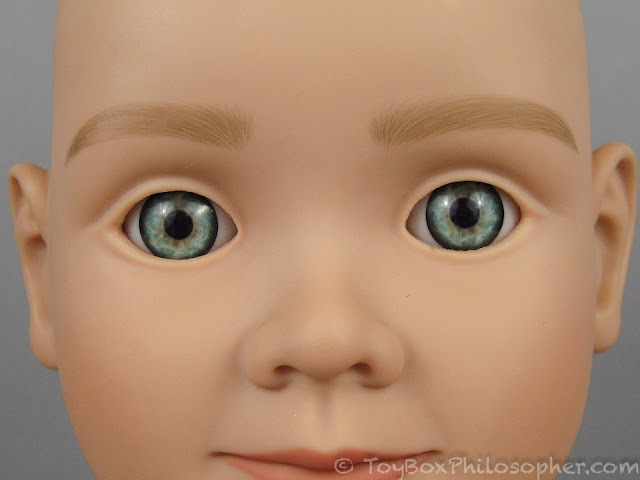 I was worried that these particular eyes would look too buggy and startled--those pupils are really small. But in the end, I think they're ok. I hope they're ok.
Can we agree that they're ok so I don't have to change them again? These came off with soapy water, for the most part. I had to go after a few of the more stubborn stains with a Mr. Clean Magic Eraser. 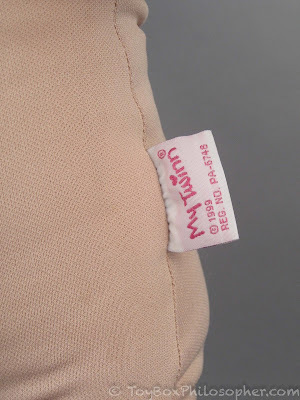 I also used a damp washcloth to spot-clean one small area of the fabric body. She must have played outside barefoot a lot. Despite the warnings on the Logan's Ladies site, I attacked these stains with benzoyl peroxide cream. 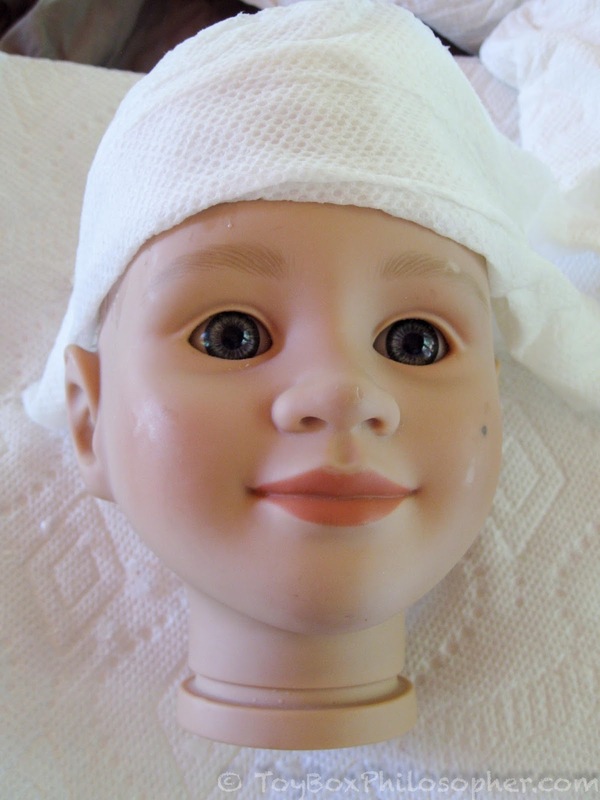 I did not leave the doll out in the sun, though (a trick that's said to enhance the effect of the cream). I will let this cream sit for a week and see what happens. I'm not especially optimistic because I've tried this treatment before with no success. We'll see! That's all I'm going to do with Tasha this week. She will get her face paint, her new eyelashes and her new wig next week. 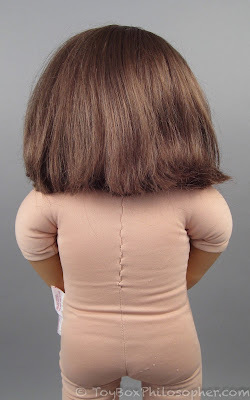 Then I'll re-attach her head to her body. It looks nice, but it's very dry. 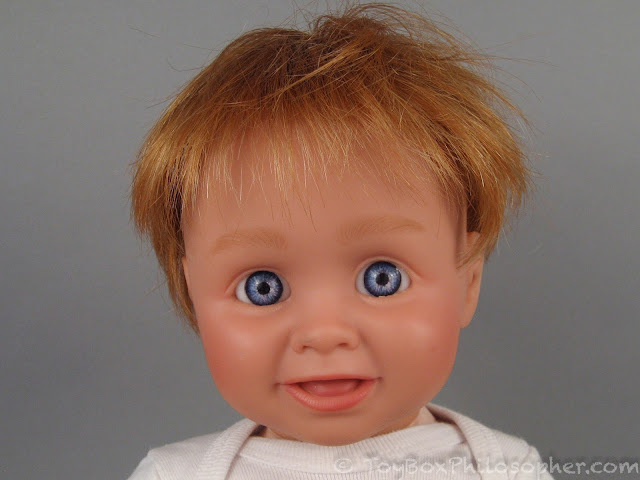 I think I'll swap it for a new wig with a bit more red in it--to match those eyebrows. I ordered a size 13-14 Monique "Majesty" wig in ginger brown, a color which sounded perfect. Audrey's old wig came off very easily. 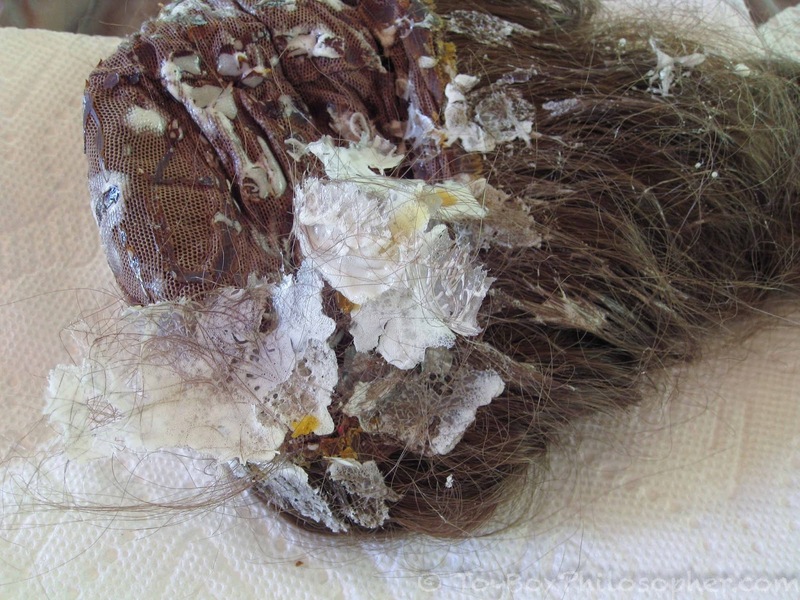 As you can see, there's very little glue under the original wigs. I removed this glue using just my fingers. It rolls off pretty easily, only leaving behind a thin sticky residue. 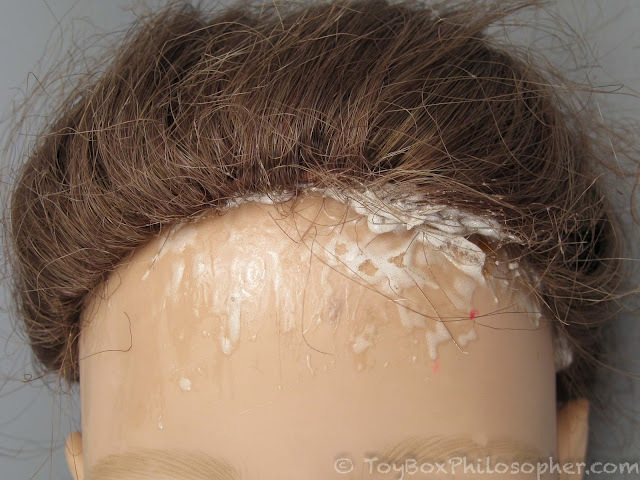 I'll use this glue pattern as a guide when I'm attaching the new wigs. Audrey has the mark "AM (2)" on the back of her head. This is probably in reference to My Twinn's name for the Audrey face mold--Amy. Audrey also needed some scrubbing with water--and a little work with a Mr. Clean Magic Eraser. I usually tear off tiny bits of the Magic Eraser sponge so that I can be very precise about it. I used to think that these (truly magical) Erasers were filled with abrasive chemicals--but no! With huge thanks to an anonymous commenter, I now understand that they're essentially fine sandpaper! I'll still only use these Erasers if water (or water with a tiny bit of soap) doesn't work. I surrender! Just--please--don't touch my eyes! 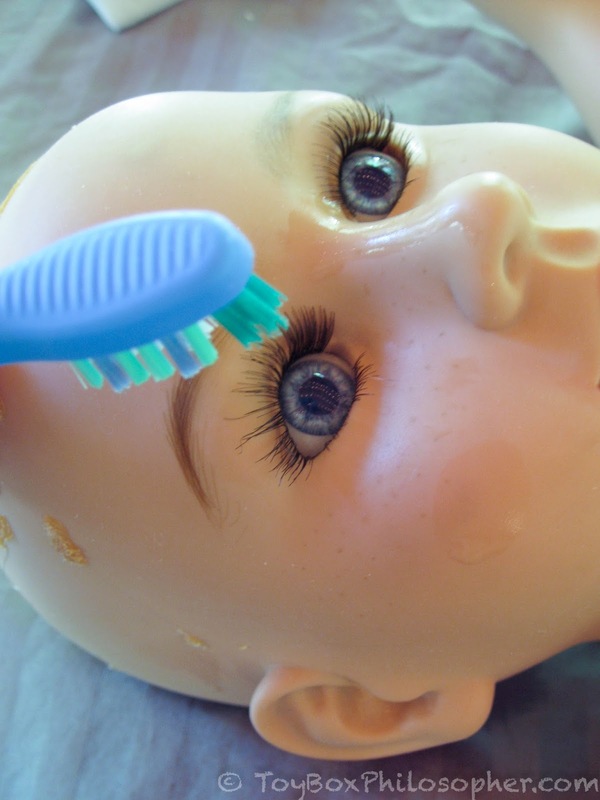 I used a damp toothbrush to try and straighten the eyelashes. 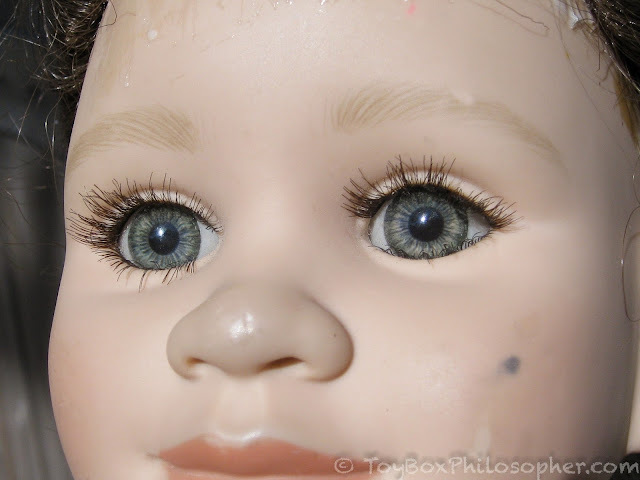 The eyelashes still looked pretty ragged, though, and so I decided to just replace them. It's interesting how different these dolls look without their thick eyelashes! 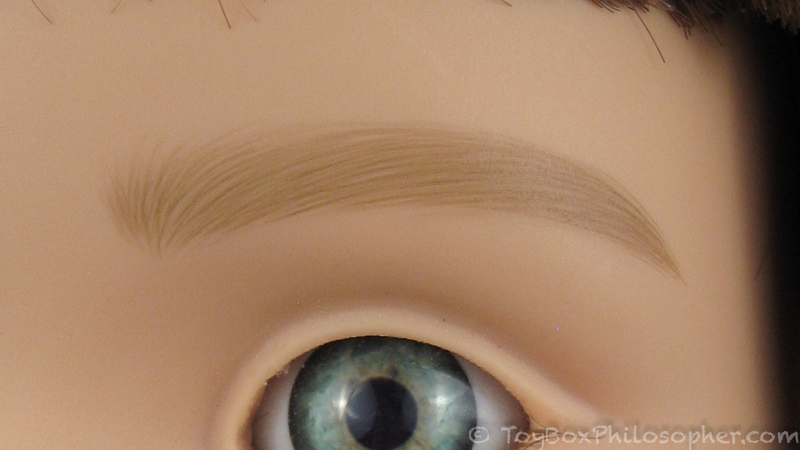 Audrey will get her new wig and new eyelashes next week. 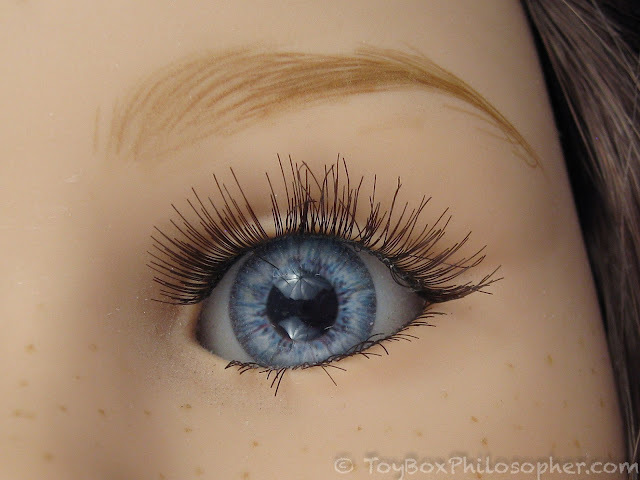 My last mission for the week was to remove Holly's eyelashes and wig...and then see if I could erase those blocky eyebrows! 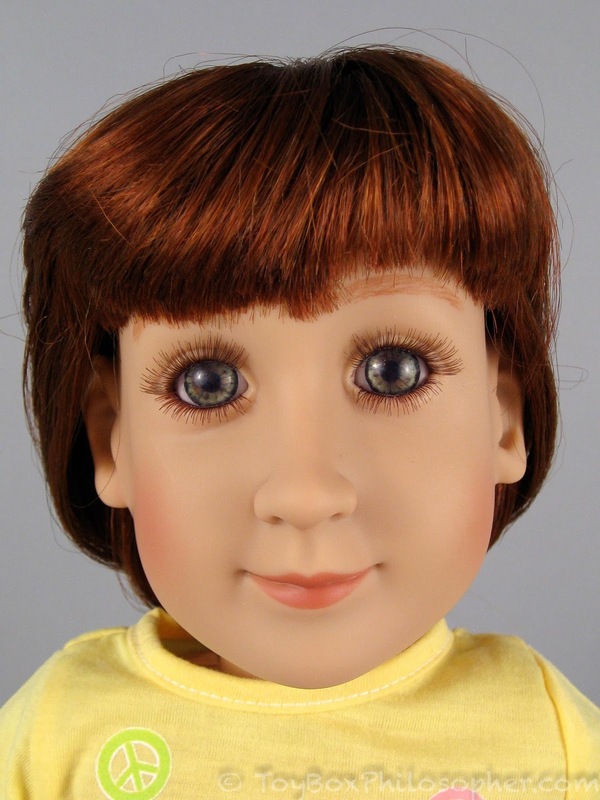 I ordered Holly a size 14-15 Monique "Doris" wig because the page boy style matches her original wig really well. I chose the auburn color because I see Holly as a redhead (of course I do). 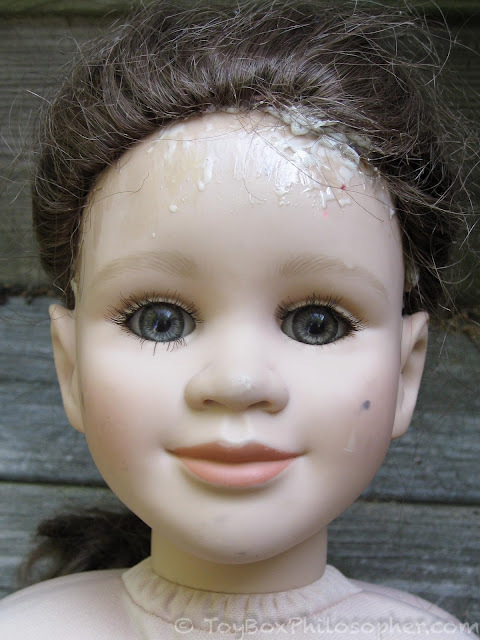 In the past I've used acetone to erase old paint from vinyl dolls, but I decided never to do this again. 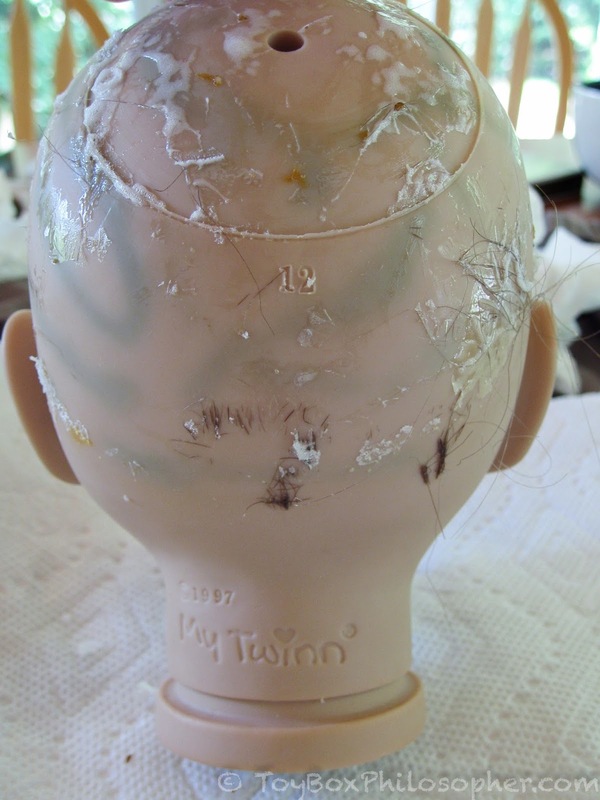 Acetone is scary stuff, and it can melt the top layer of vinyl and instantly ruin a doll. Holly looks apprehensive. I think she saw the screwdriver. 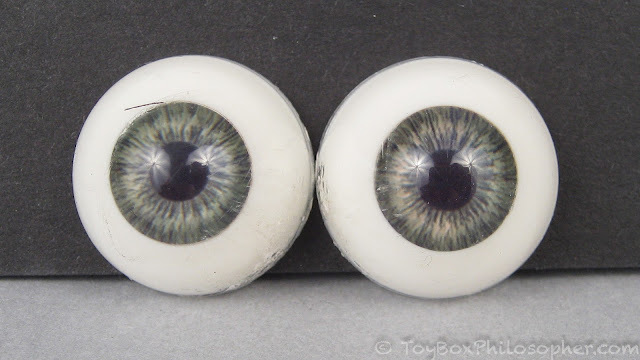 I'm still waiting for delivery of the 16mm replacement eyes that I need for my smaller My Twinn dolls, so I was not able to make any progress with them this week. 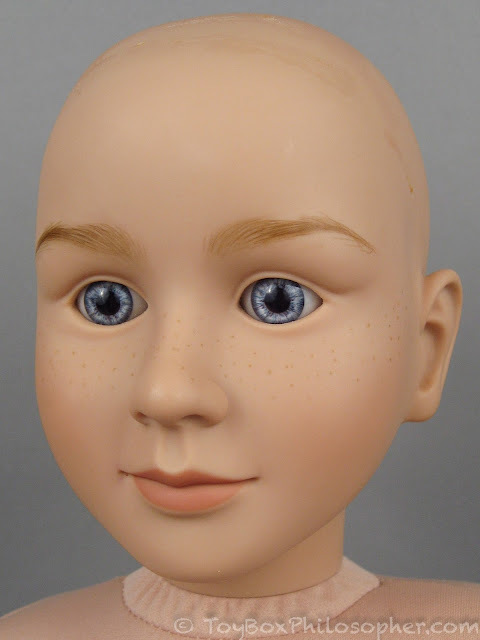 At the end of week one, I have three clean, bald My Twinn dolls with lovely eyes...all of them waiting for hair and eyelashes, one waiting for new eyebrows...and the other anxious for some new face paint...and a reunion with her body! 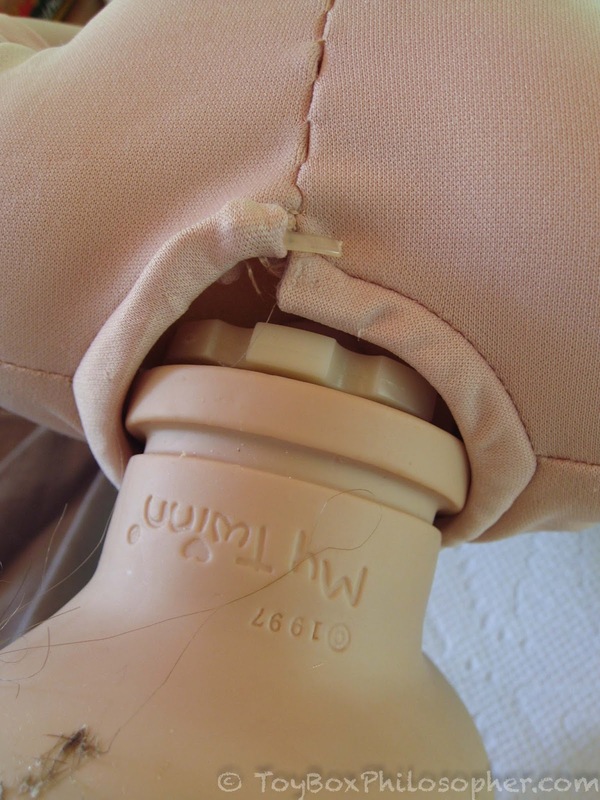 This is a really great detailed post about the steps you've taken to restore these dolls! It's very obvious you give them quite a bit of love and care. Just one side note though -- magic erasers don't actually have any chemicals in them! They are basically very very very fine sandpaper in spongey form. No way! That's so cool! Thank you so much for telling me this--I've always wondered what the secret was. :) I'll go change my post. Now it makes more sense why the 600 sandpaper was similarly effective. Oh, and also why I've seen suggestions to use these Erasers on shiny vinyl spots! It all falls into place. I really liked seeing your project so far. Im looking forward to the update, especially seing them with their new wigs. Anyway, I love what you did here! 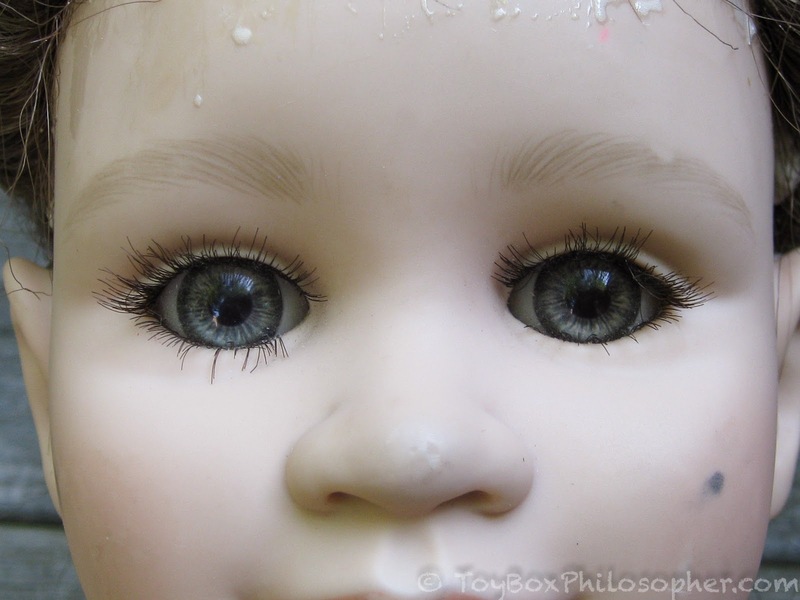 Will you change the eyes on your older dolls? They are super creepy! 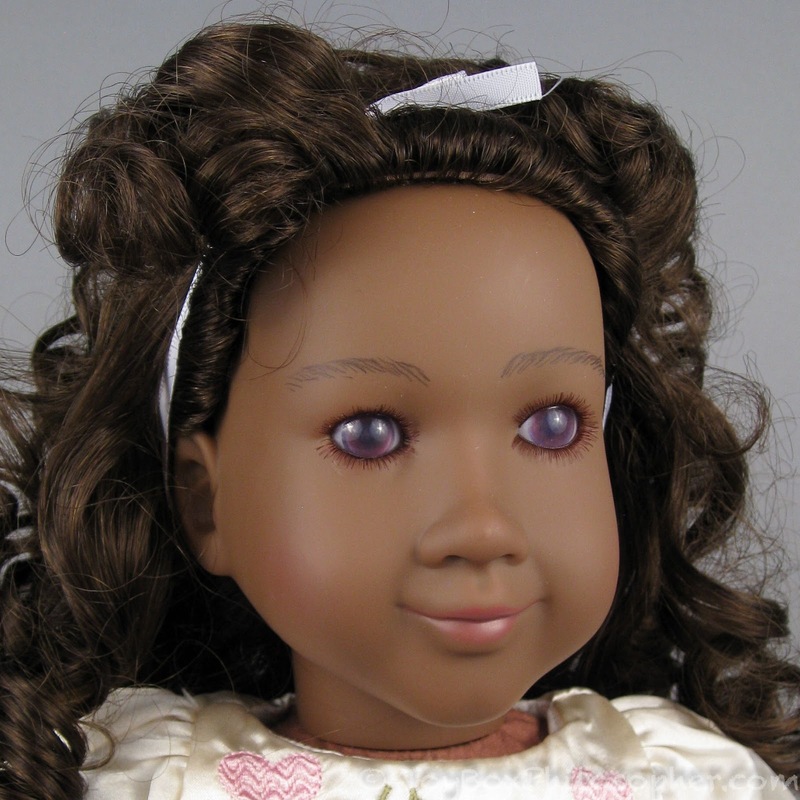 Funny how yours all faded and the new purchases had more or less nice eyes (even Tasha wasn't nearly as bad as your old dolls). The baby turned out very cute, I think the name Finn suits him. The difference is incredible! I can't wait to see how the rest of them will change after your manipulations. BTW the generic name for "magic eraser" is melamine sponge, you can buy 30 of them on Aliexpress for like a dollar, which I imagine is cheaper than the name brand. I'm still waiting on new eyes for the 18" girls. They're coming directly from Secrist and there must be a delay. I definitely plan to change the eyes, though. Even if I have to order more eyes. Thank you for the tip about Magic Erasers. I rely on them for dolls and also for my bathtub!! This post was so nice to read! I am very excited to see more of your projects! Thank you Emily! Thank you, Micah! 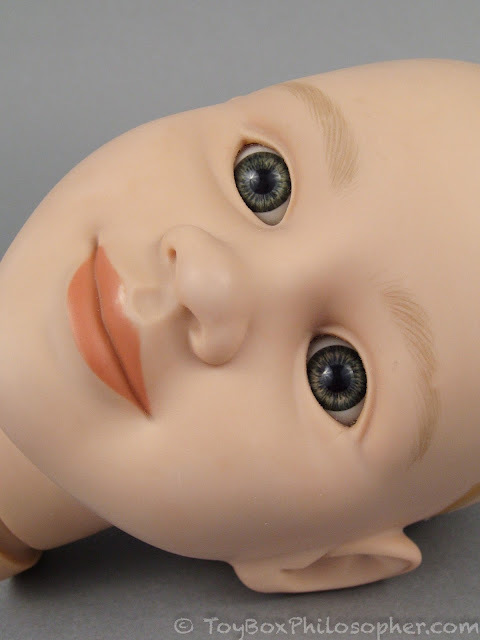 Doll projects are one of my favorite things ever, and so it's really fun to share them with you. I love it when a good project comes together! 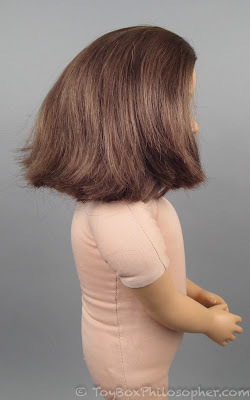 I'm not sure it'll work as well on the larger dolls, but to pop the heads off of my smaller (MH/Barbie/16" Integrity) dollsI wrap the head in a heating pad and walk away for a bit. They end up nice and squishy with less chance of scorched plastic. 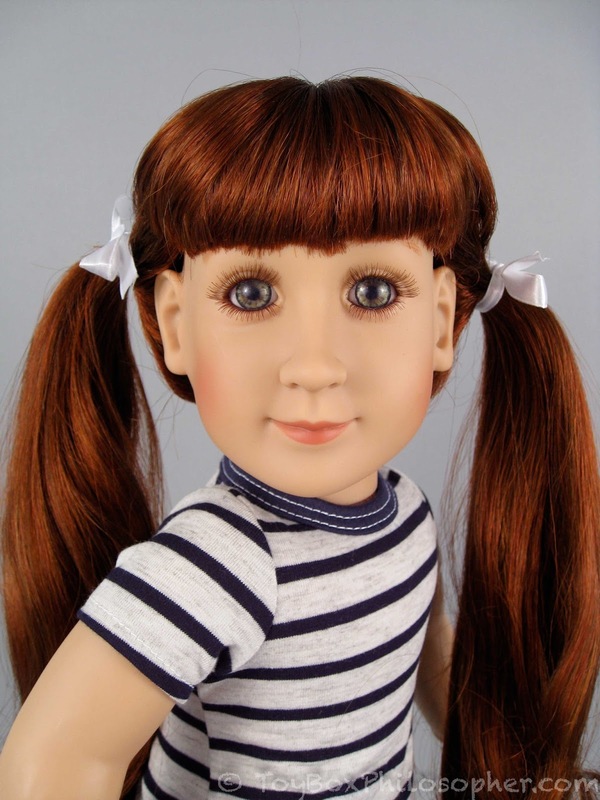 I just discovered My Twinn dolls recently and then found out they were retired! But I love doll projects and cannot wait to see how these lovely ladies turn out! I so wanna do the same thing, buy a 'well loved' one of eBay and fix her up! That'd be cool! This post was fascinating! Love the way the girls are looking already. This is really interesting stuff! I can't wait to see the next installment. You're being really brave with this restoration process! I get nervous even changing doll clothes. 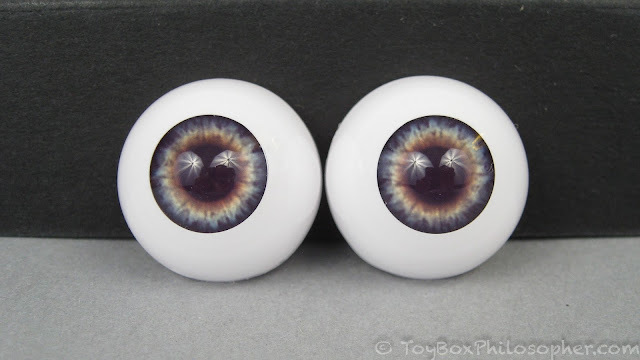 I think about Blythe owners, who seem to futz around with eyechips and eyemechs and swapping scalps and gaze correction quite casually, and it gives me the shivers, lol. Here's hoping that everything works out the best it can! Fantastic post, the writing, humor, attention to detail and amazing pictures are all there, absolutely your trade mark. You can write about anything and it will still be wonderful. This was awesome!!! :) I'm SO glad that you're back on the blogging scene. I missed you a lot, and incidentally, I celebrated my 1 Year Blogiversary this past Sunday, which NEVER would have happened if you hadn't let me do a guest post!!! :) Thank you so much for everything you do. I love this new project series idea! 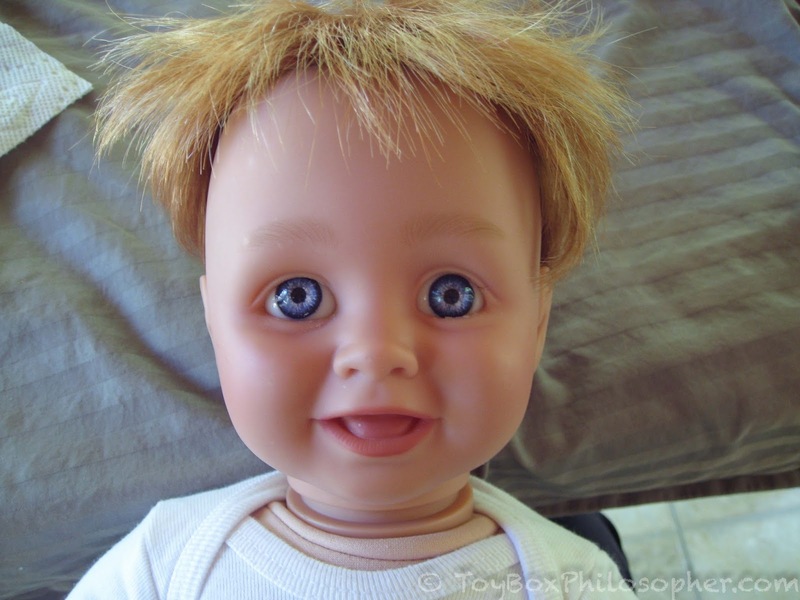 Your adventure with the old Baby Dimples dolls is one of my most favorite posts from you, I've read and reread it countless times. The little baby is adorable now! Finn is an adorable name, but I think he looks like a Jacob or a Jasper. Good luck in the coming weeks, I hope everything goes smoothly! I ended up with 6(!) of the 18 inch girls thanks to you, and I've noticed lately that their eyes are turning cloudy as well. It's good to know there are options to replace them. I enjoyed this post a lot. I knew someone as detail-oriented as you would make it interesting and informative. Because I knew Magic Erasers are fine sandpaper I'm wary if using them unless I really want to sand something off. I find that Ivory soap removes a lot of stubborn grime that doesn't seem to be yielding to regular soap and water. Do you put tape on your screwdriver to keep it from scratching the eyes and face because they sure looked smooth despite what they'd gone through. 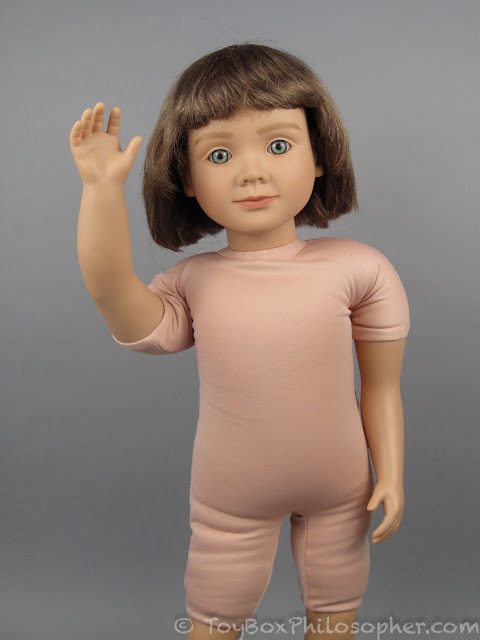 Can't wait to see what happens to those fingertips, I have a doll with the same problem and even benzoyle peroxide hasn't helped. I know it can't be dirt because she has never gone on any adventures so this is a mystery and I'd really appreciate finding out how to get rid of this. Thanks for this post Emily and I look forward to see how these projects go. This was really cool to see (albeit unsettling during the no eyes parts)! Finn is a nice name, but he kinda looks like a Charlie to me? Benzoyl peroxide works, but only if it's heated. It's not about the sun/UV rays or anything. I put doll parts in my car during summer to warm them. And I know some people have had success with heat lamps or heating pads. Can't wait for the final reveal! My Zoë's eyes are doing the EXACT same thing as your Cai's. I'm going to have to eyeswap her, and do some major limb tightening on both her and Quinn. Since 18" My Twinn dolls are built the same as American Girls, I'm thinking of buying a couple of those restringing kits on Ebay with the tension cups in them and doing away with the nylon washers that hold these girls together usually, because they do nothing for them in the "keep their limbs tight" department. It's just impossible to pull the cord tight enough for it to stay that way for long, even with using ferrules instead of knots. It took Quinn a week to be back to being so loose-limbed she couldn't stand on her own, and Zoë's gotten that way over the last few months. That was a lot of work but you persevered and so far, your dolls look great. I really enjoyed this makeover post. Can't wait to see the final product. I am so happy to see another post so soon! These project posts seem like a great idea... Especially because I would never try anything like this out of fear of ruining something. 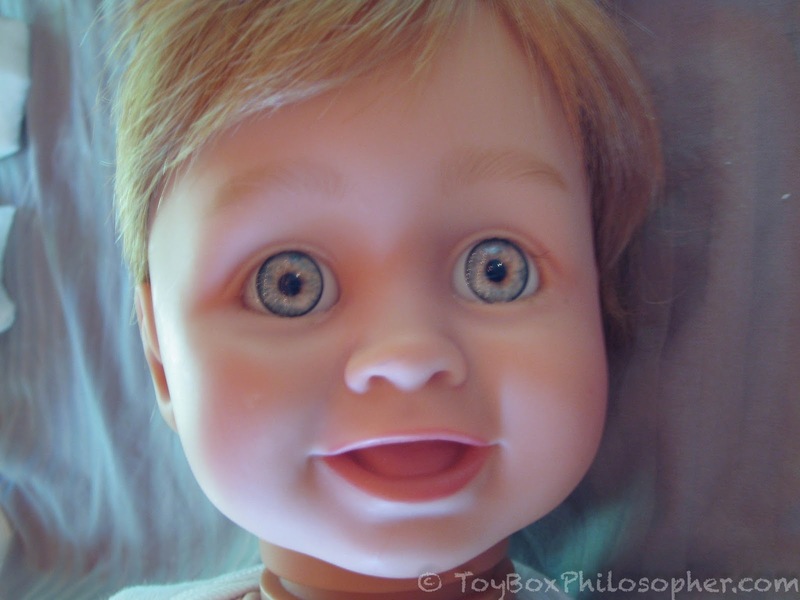 The baby is so cute with his new eyes! 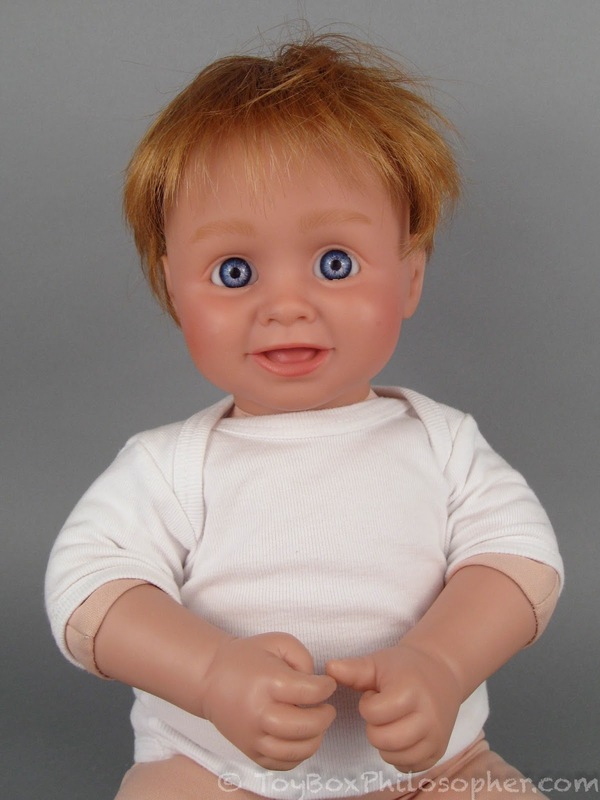 Seeing him makes me want to get out my Lee Middleton dolls. This is a fascinating post! I really admire people with the guts to tackle custom and restoration work to this level. This is inspiring for my own custom project, which, while not detailed as this, still freaks me out a bit. I think the baby's name is Isaac (meant to be sacrificed but saved in the end). Hi i have loved your blog for a very long time and am glad your back! I have a question: can you review LPS(littlest pet shop)? I saw your blythe review but you didnt review the pets that came with them. A little boy who got a second chance? Oliver! I adore this new series! I can't wait for next week and I'm so thrilled you're updating again. 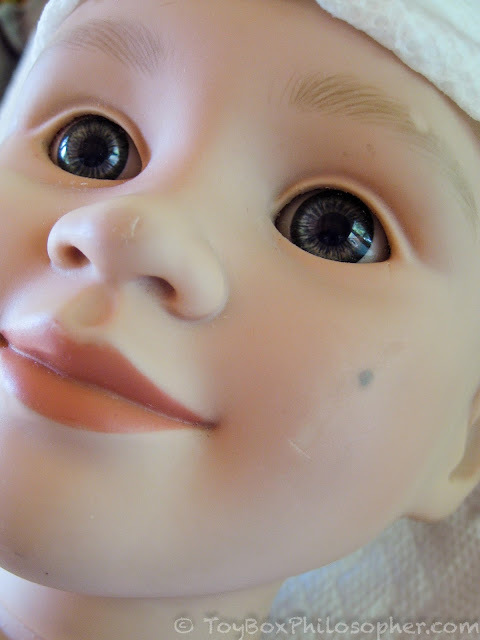 Restoring dolls and giving them a new life is just one of the most fascinating things for me to see I love being apart of it. Keep up the great work, your dolls are looking so lovely. This is amazing, I'm excited to see where it all goes! This post was thoroughly entertaining. I cannot wait to see your progress. I think his name should be Finnigan. 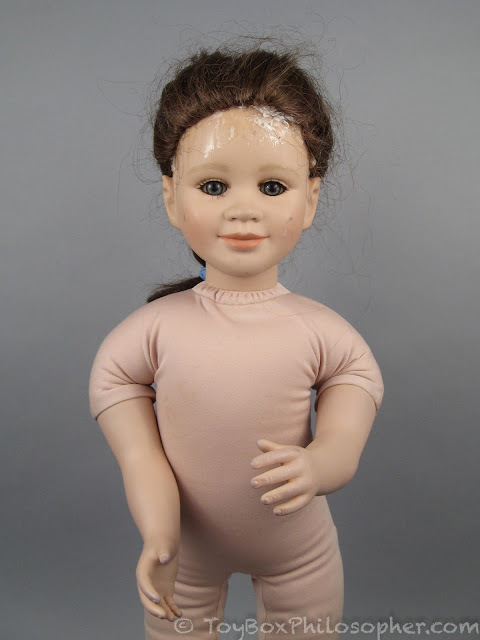 You got me into Tonner dolls, and now you're getting me into restoration. :D I always wanted to get a MyTwinn for my daughter, but the problem always was, and still is, now none of the heads are even remotely similar to her. Did you ever post a review of your Annette Himstedt doll? I can't find it, if you did. I love your blog!! It is so fascinating to see your project and I can't wait to see your finished dolls. I love how you're giving these dolls new life even after the company went out of business. That startled baby before picture had me in stitches. 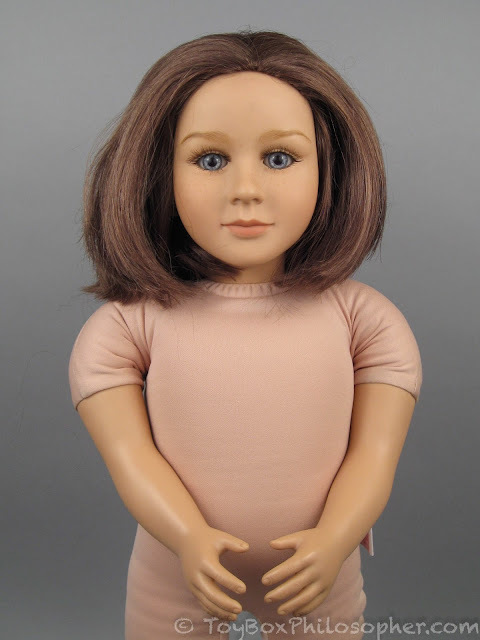 Whenever I read your blog I am reminded of the old magazine Barbie Baazar. I read it as a kid and it made me so happy to see Barbies both vintage and new. Your blog gives me that same nostalgic feeling. Thank you for the post. Why do we wear garments? Dress is thought to be one of the fundamental requirements for humanity. The route each of us sees the reason for wearing garments can contrast. The principle reason for wearing garments is to cover us. For models, different sorts of garments are imperative since they are classy and in vogue. Workplace protection agcy. Wow, Emily, you are so much braver than I could ever be! 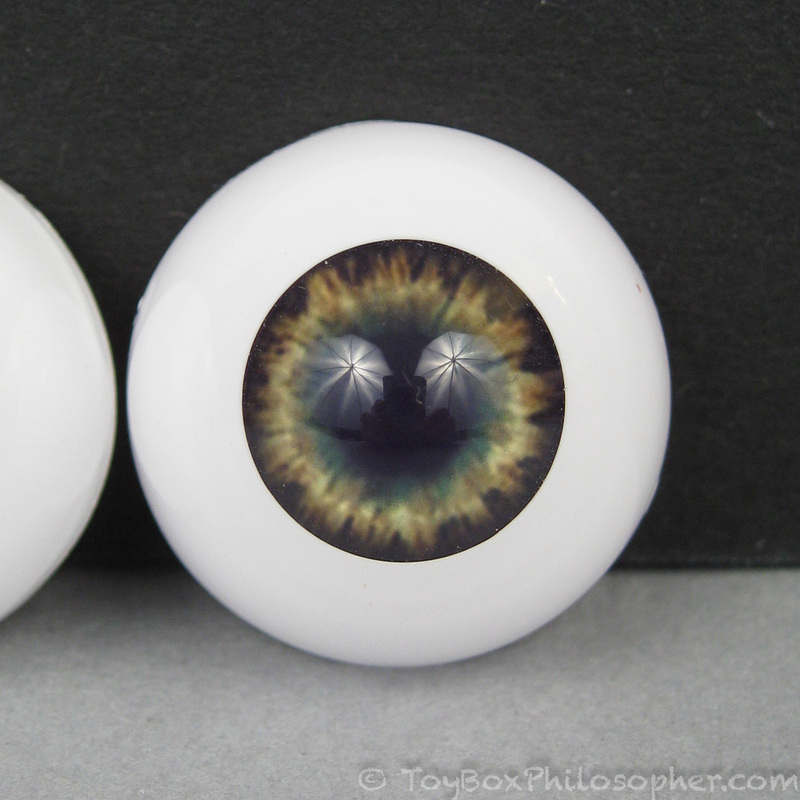 I am curious as to why the eyes discolor over time. 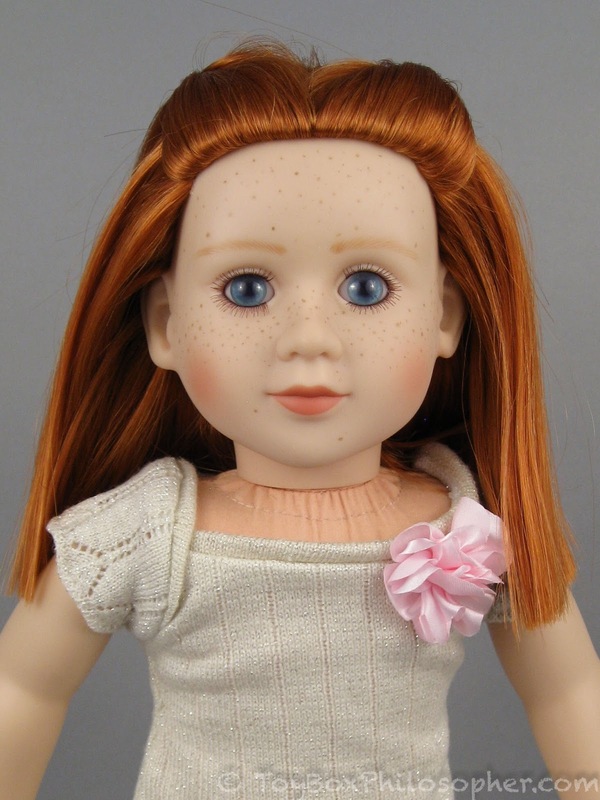 I have seen that with some of the AG dolls too. 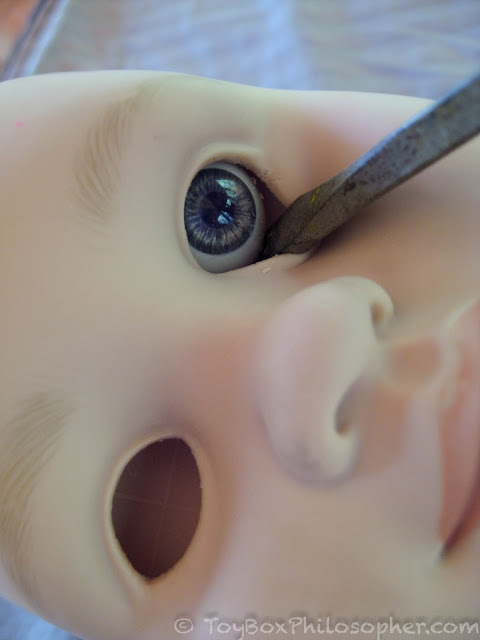 Thanks for sharing your process for cleaning up and changing eyes on these dolls. I am so impressed with the transformation so far on Tasha! Can't wait to see her completed. I also love that Finn got a second chance. He is now actually very cute and deserves to come out of the garage. I, uh, I really like those faded 'zombie' eyes, lol! If the cloudy eyes survive the removal operation, would you consider adopting them out to a loving home? I purchased a new head for $1.50, a wig for $1.50 and a new body for just under $2.00 from My Twinn as they were closing out their stock. 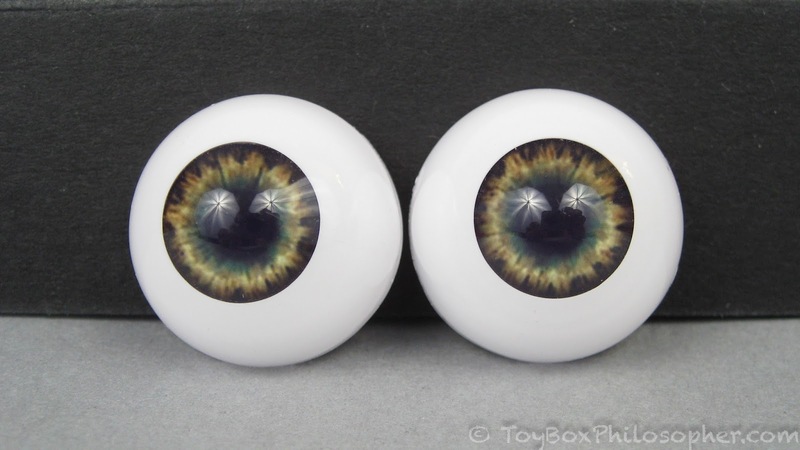 I bought eyes from Dollyann for $5. 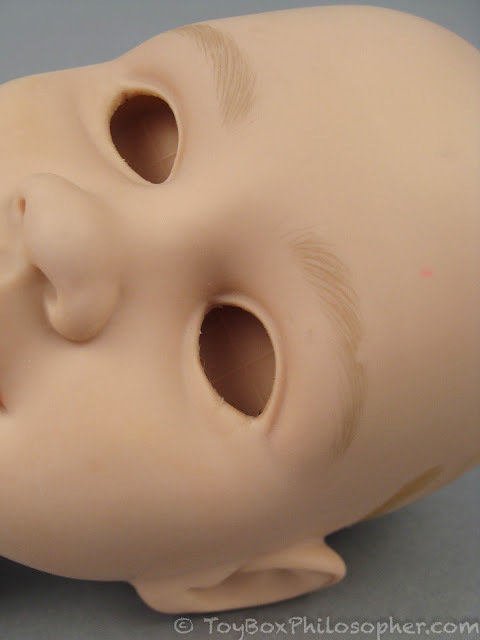 I found that using a small knitting needle to bring the lower eye lids up over the eyes was a good choice. I also used a knitting needle through the hole in the back of the head to help me straighten up the eyes. It works great! 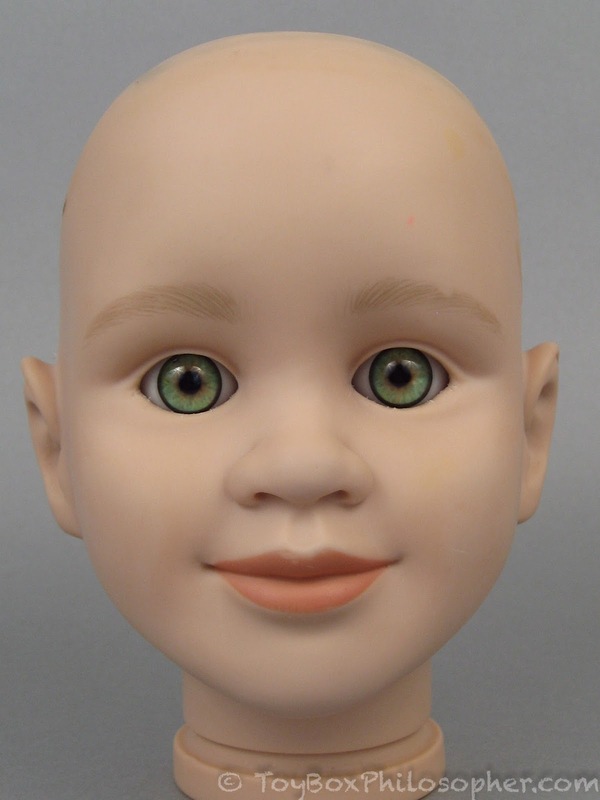 I am building this doll from scratch and when all is finished, it will have cost me $around $12 for everything to have a brand new doll. It's been so fun. I still have to learn how to paint eyebrows, but I have lips, cheeks and freckles down. I never knew ho to remove eyes, but I think I can change some of my other dolls eyes thanks to your blog. Thank you. LOVE your post.I pulled our My Twinn dolls out this morning. Girl and boy, Sarah's doll went everywhere with us. People would come up to us in the store, because she was in the seat, to see if she was real. Eli's, well, it was just because I wanted one to look like him. Hubs almost had a heart attack. Ha. I won. :) Both of mine are missing lashes. What do I do? I check on doll repair here in South Alabama, and I couldn't find anything. I want the girls eyebrows redone, because Sarah has honking eyebrows, and those were so faint that you barely see them. 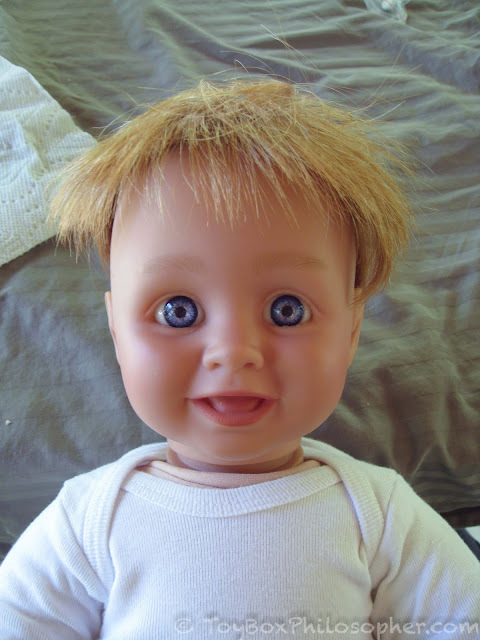 Eli's doll's is the same way, but his aren't as dark. 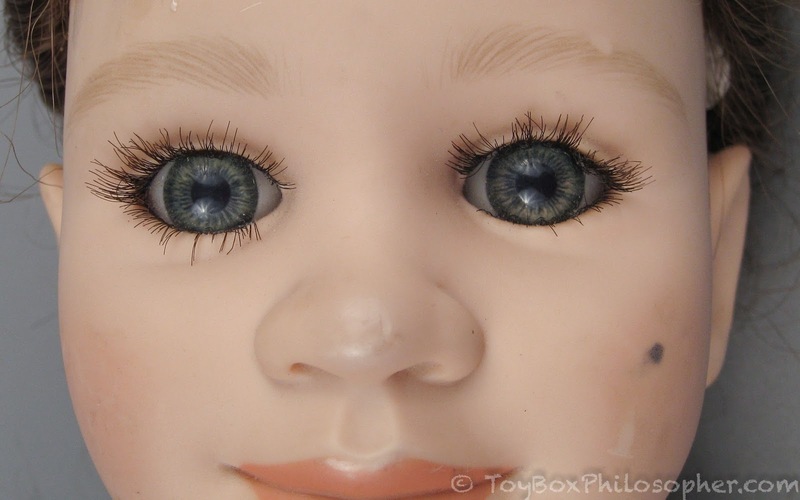 My dolls are marked, on the tag 1999, and head is 1997 for the boy, He has those beautiful eyes. Girl is 1996 head and 1997 on the body. Her eyes are a little fuzzy, and too light to match Sarah's. We always bought 3 month baby clothes and shoes for them. I just made AG furniture for a friend's gdaughter. It was fabulous, if I must say so myself. Hence the unearthing of the dolls. Hubs is wondering about me now...keep the man on his toes! 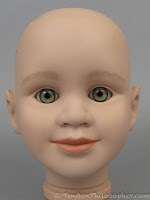 Guess that I will start playing with dolls in my 50's. Thanks and let me know about the lashes. 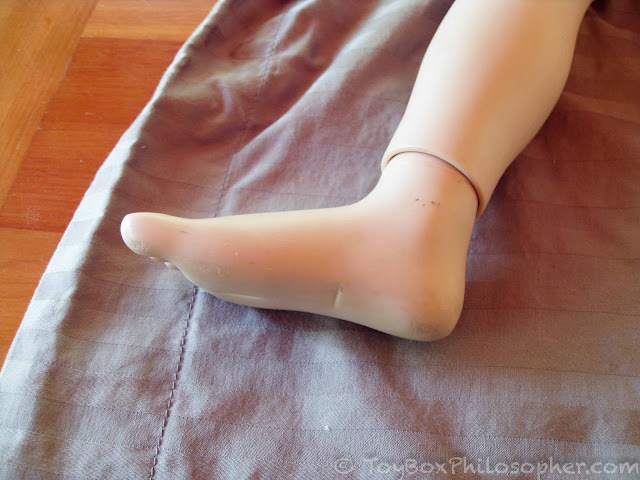 My daughter broke her My Twinn dolls leg off...she was doing a split. I went to the website to see about sending it back to be fixed, when I found out they went out of business so now what do I do? I desperately want to reach someone from the My Twinn Company, is there a number at all that would be possible to talk to someone! We are getting ready to move, and I just looked at our My Twinn dolls from the 90's. 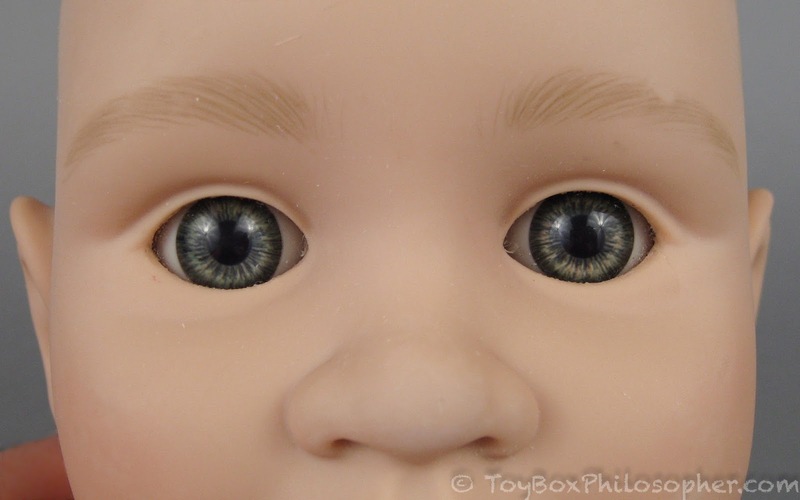 Their beautiful blue eyes are now pink and hazelly-pink. Does anyone know anywhere that I could go to get them fixed. They looked exactly like my daughters! Thank you! Mine are like that too!!!! 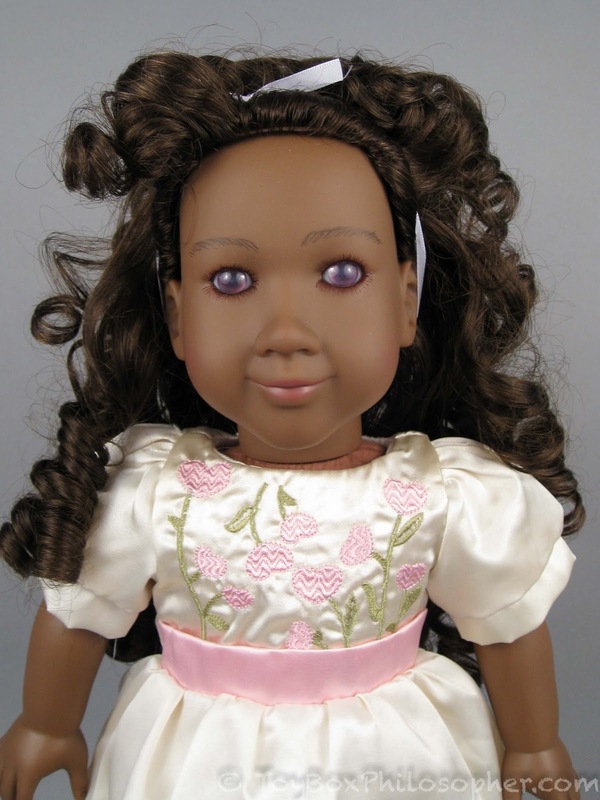 I have 3 My Twinn dolls. One might be from 1996 I have to check. 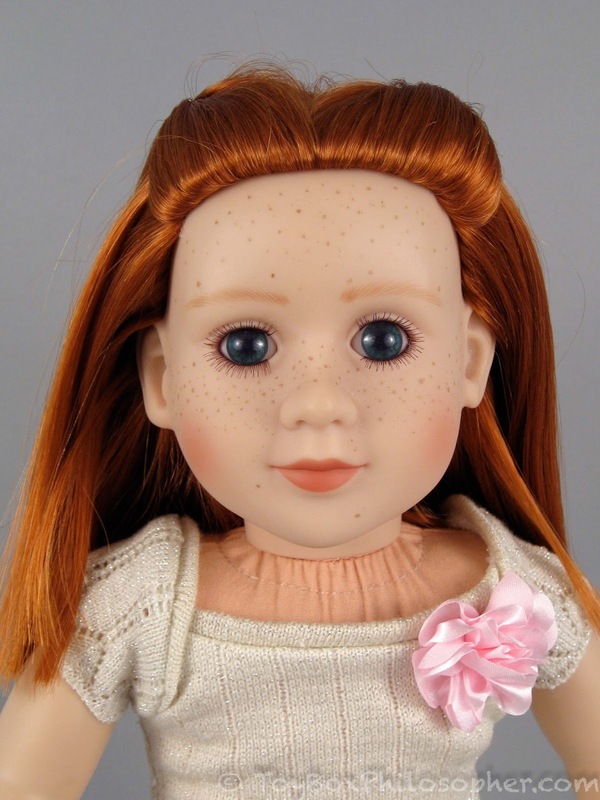 I do have one doll that her brown eyes turned to red. What can I do? check out MyTwinnCollectors on FB. 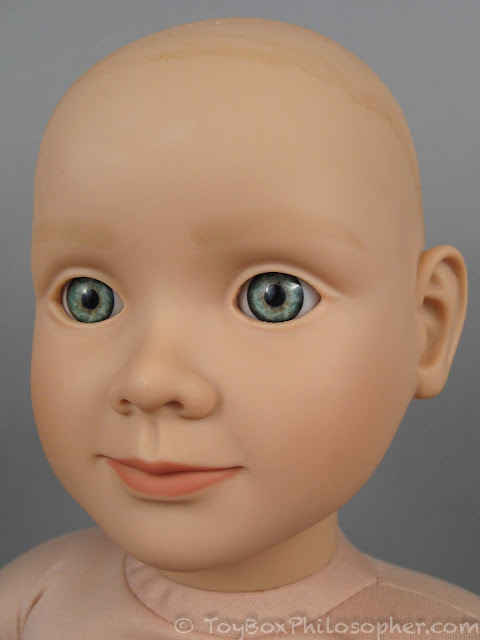 although this tutorial here has how to change out the eyes. Thank you so much for all of this information! 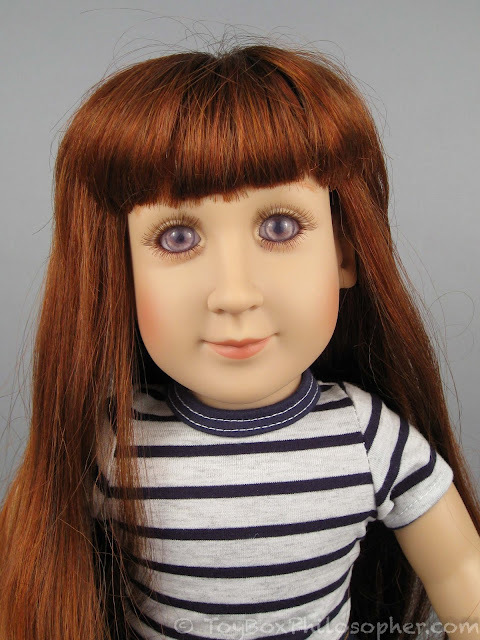 I'm new to the My Twinn world (I was and still am an American Girl kid) and this makes me REALLY excited about the possibilities!